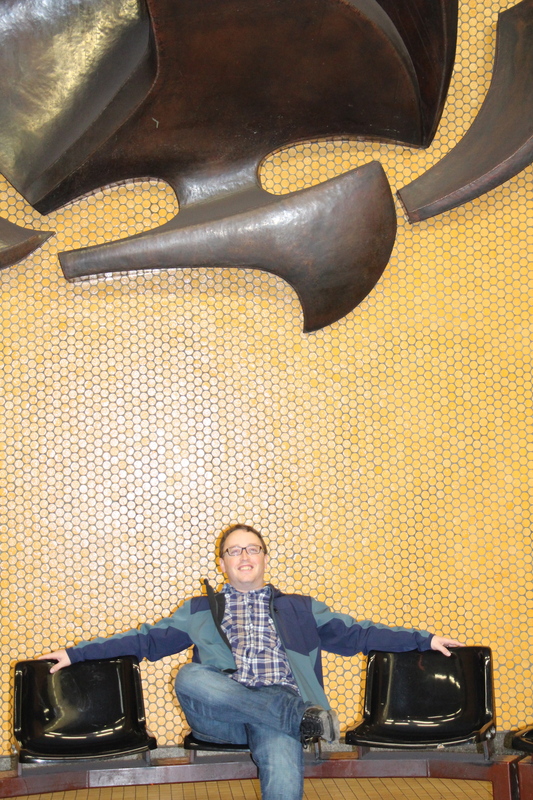 We took the train (which I LOVE), and wandered and explored and tasted and explored. It was lovely, especially since it was a last-minute decision (we’d been thinking of going to the Disney Castle, Neuschwanstein, but the weather there looked distinctly un-promising), and I am VERY glad we went! Getting off the train, we walked around the empty moat for a bit. 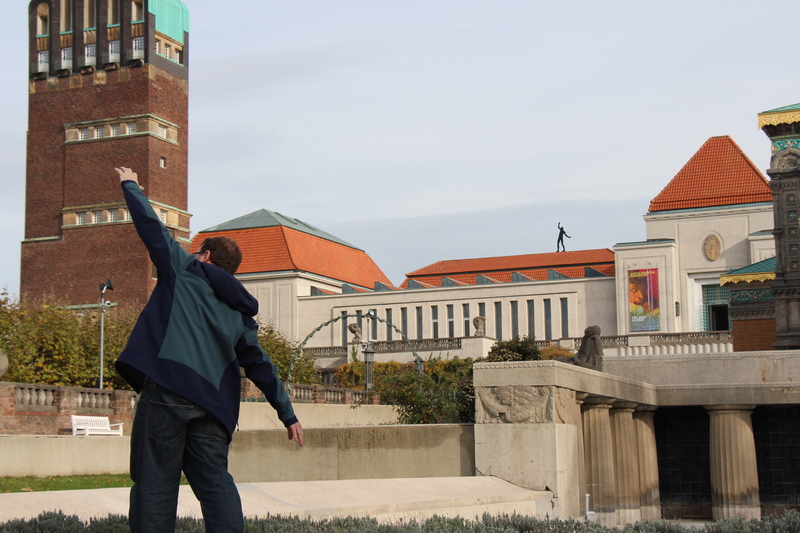 and took in the sculpture garden. 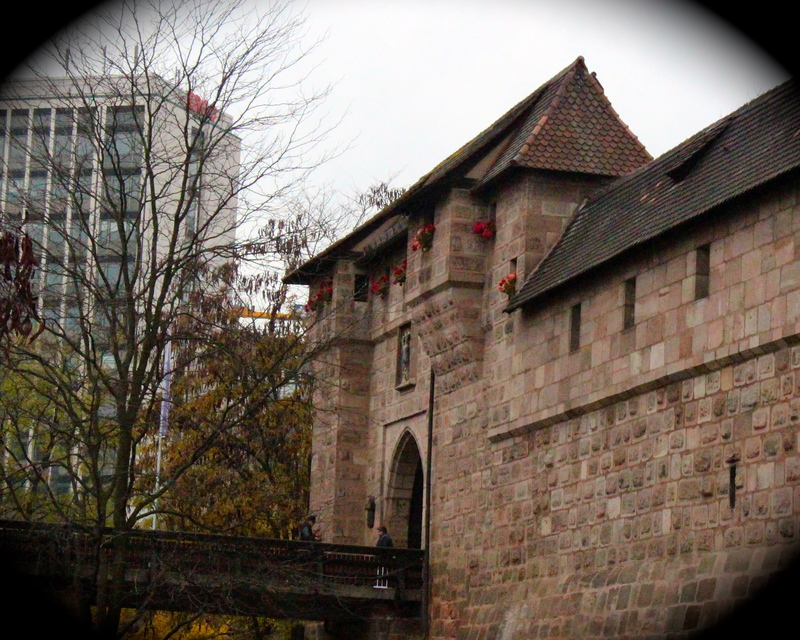 Par of the city wall around Nuremberg. A different take on a sun dial. hallowed halls, indeed. 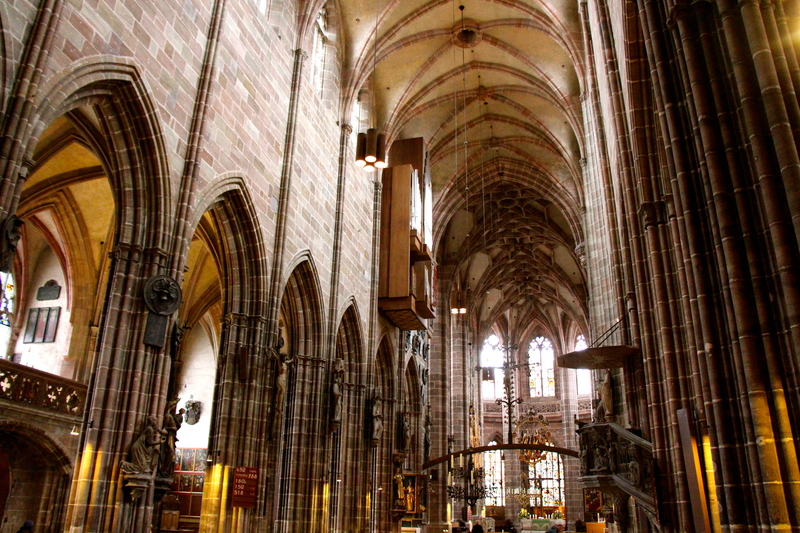 St. Lorenz Church (I think). This jolly fellow was also popular with the pigeons! A plaza in memory and honor of Aids victims. 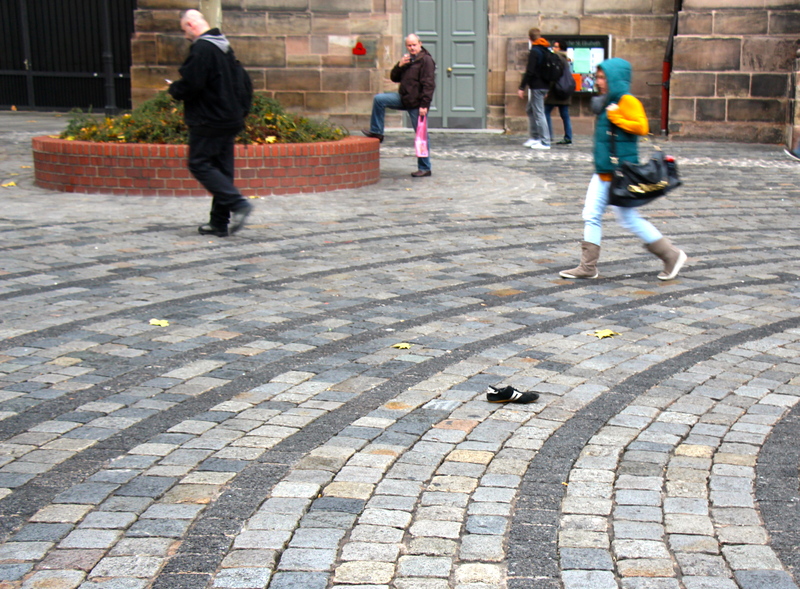 Standing in the middle of this square, I realized that I had never thought about Aids in Germany, at all. Or Europe in general… As a side note, I also realized that it isn’t just in Atlanta where people mysteriously lose only one shoe. I can say, definitively, that this has never happened to me. Lovely tower or subway stop? You be the judge. 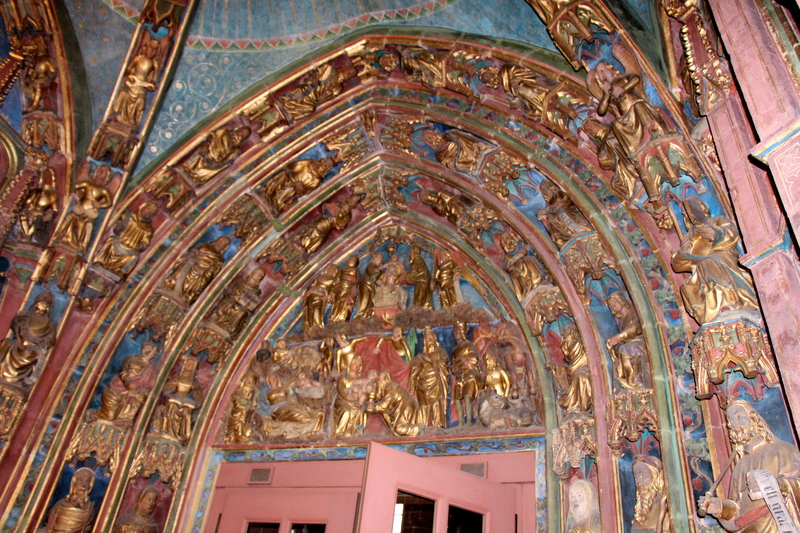 A mural depicting the rebuilding of Nuremberg. 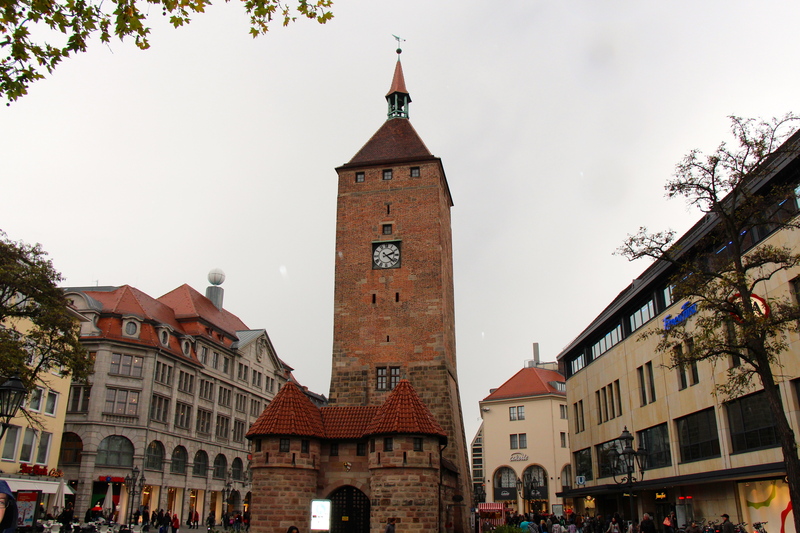 It was heavily destroyed in the WWII battles for Nuremberg (on 2 January 1945, 90% of the old town was destroyed in just 1 hour; Nuremberg was the spot of another 4 day battle in which hand-to-hand combat was used until it was won by the Allies). 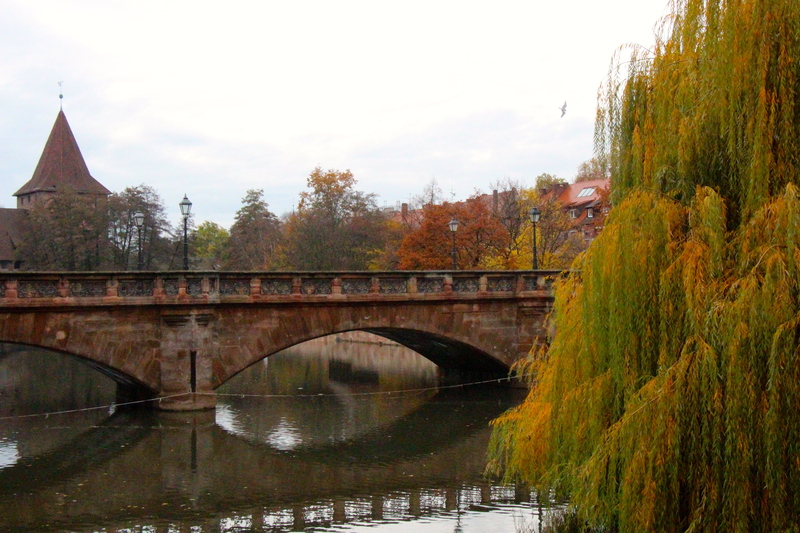 Nuremberg was an important site for the Nazis, not just because of their parade grounds that were here, but because a lot of weapons, aircraft, submarines, and tank engines were built here. As such, it was also a popular destination for Allied bombs throughout the war (at least from 1942 on). 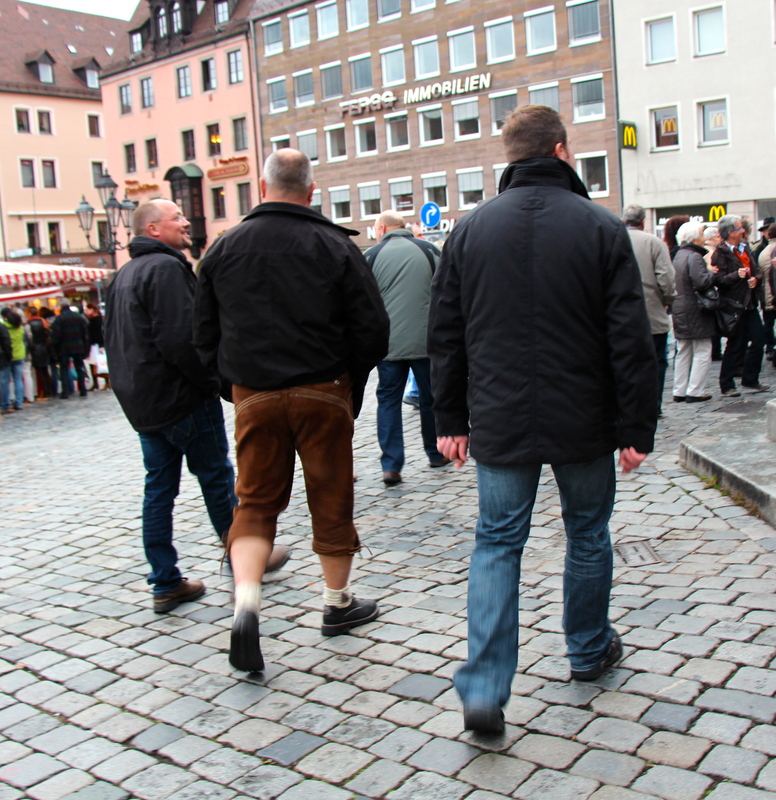 Yep, just your average joe, wearing lederhosen through the market square. 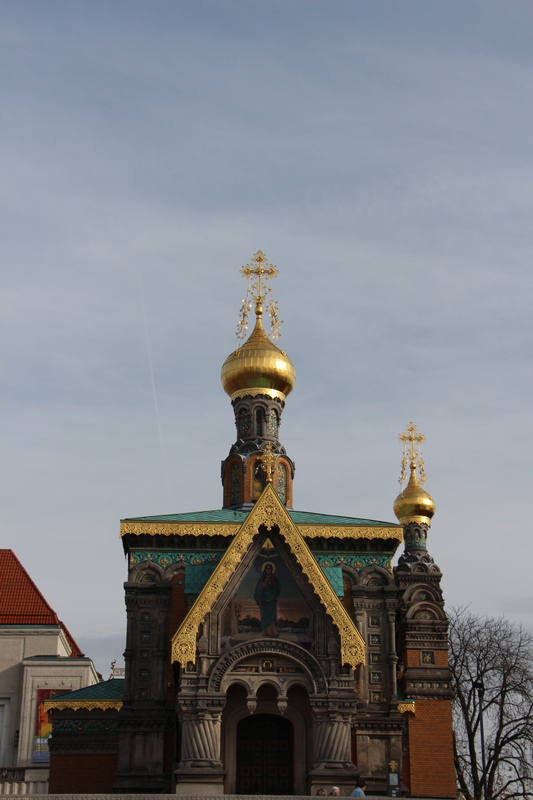 Church of our Lady, Frauenkirche, on the market square. Looking up towards the castle, which offers lovely views of the town. 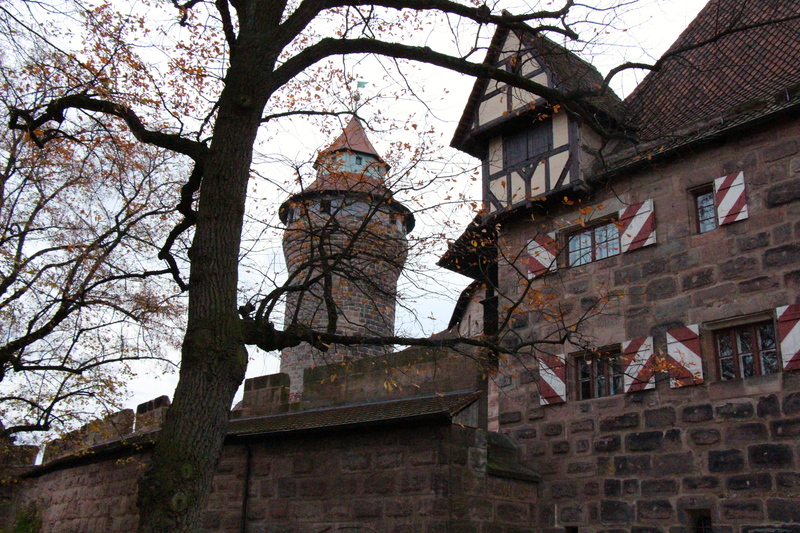 Parts of the castle go back to 1050… Other parts now serve as a hostel! 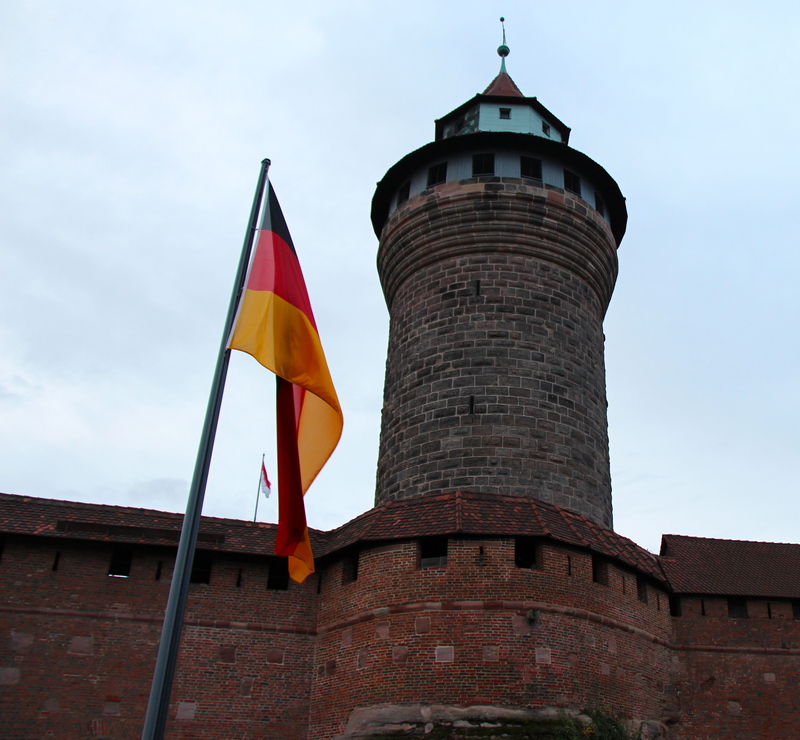 The castle was the visiting home for the Emperors of the Holy Roman Empire! 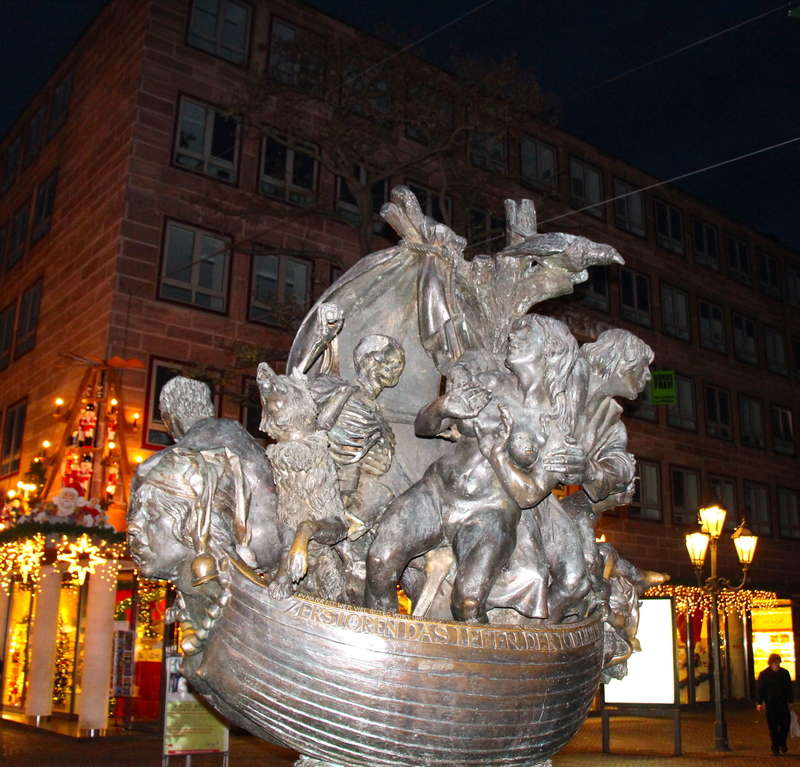 Appropriately named Schöner Brunnen (beautiful fountain), as seen in the evening. 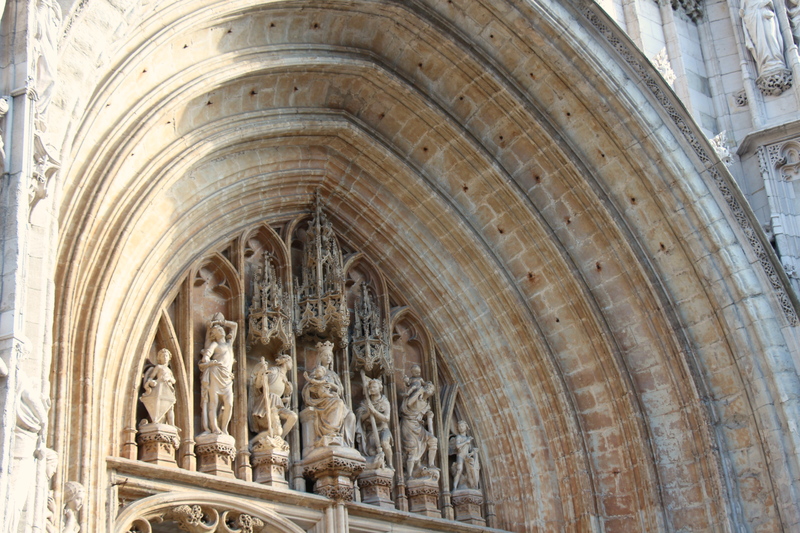 Along the bottom row, you see figures representing the Free Arts and Philosophy, the next row of figures represent the Evangelists and Latin Church Fathers, the 3rd row hosts the 9 heroes and 7 electors, and the top row shows Moses and the 7 prophets. A bunch of people kept climbing the fence around it and kissing this one place, but I haven’t found anything that indicates why several people who do this… People are interesting, folks, that is for sure! 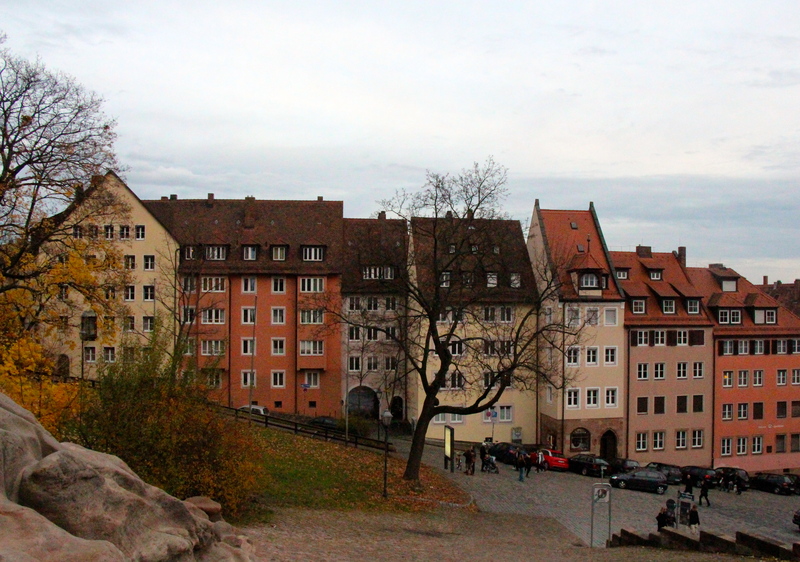 This was one of my favorite parts about Nuremberg… so pretty! 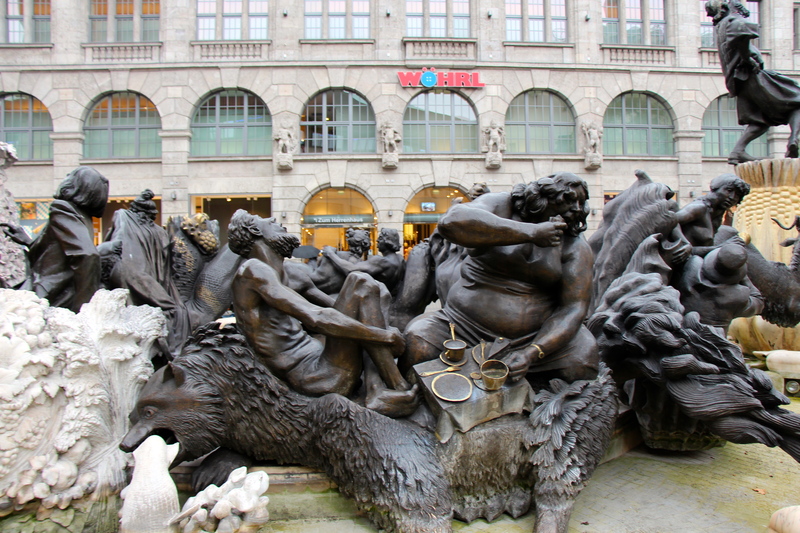 This fountain represents 6 different takes on marriage… All of them on top of what look to be angry beasts… I’m not sure how to take that! I’m already looking forward to our next visit! 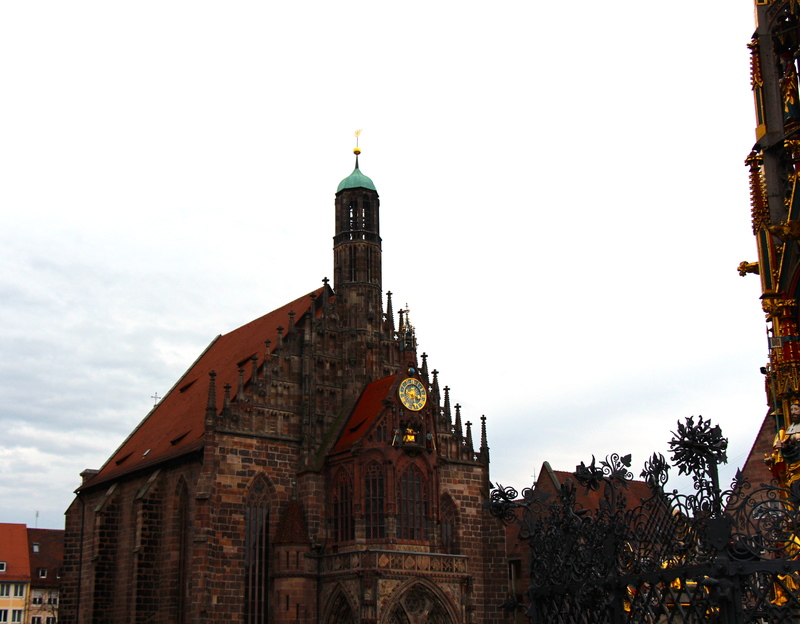 We didn’t even get to go see the place where the Nuremberg trials took place! In the meantime, though, this weekend we head off – 1st stop Neuschwanstein! Then, it is Italy or bust! 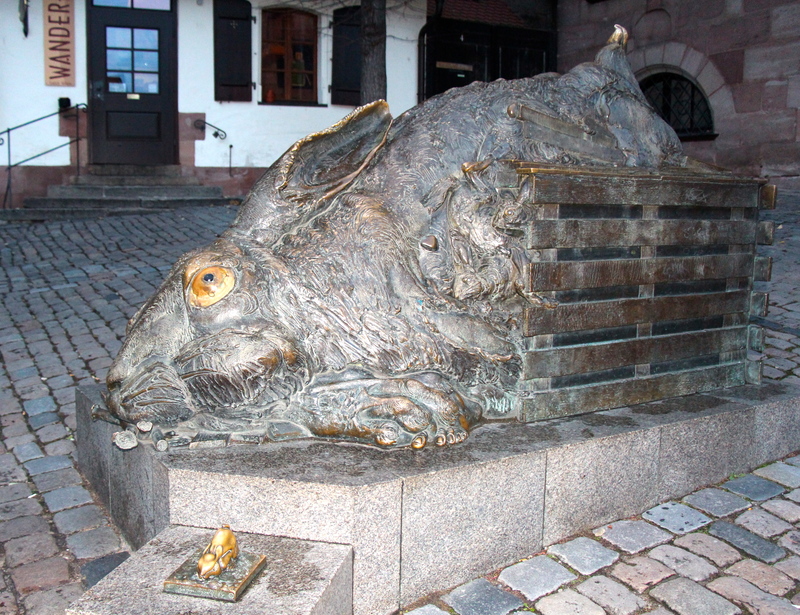 I kind of feel like Darmstadt has been strewn throughout too many posts to organize a cohesive imagination of what it might be like to someone who has not visited. 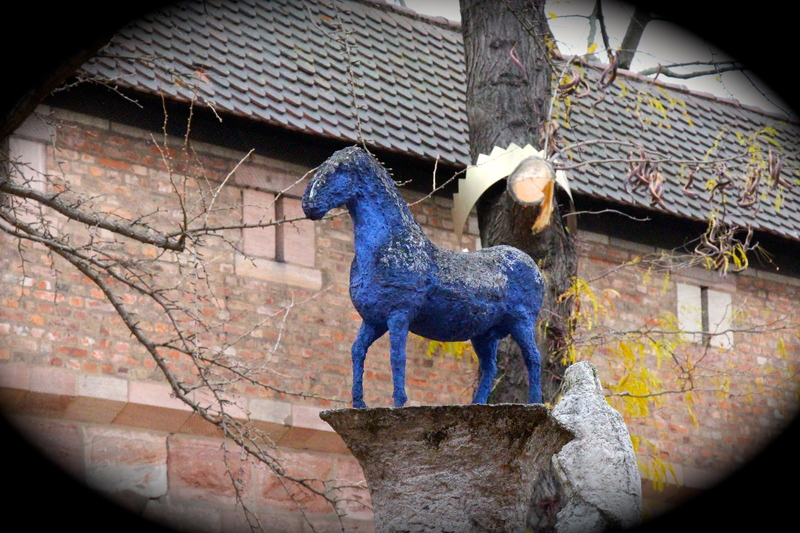 Or, maybe that is exactly what Darmstadt is like: multi-faceted and different with each turn… In any case, here are some more pictures from our All-Saints Day day-trip there. 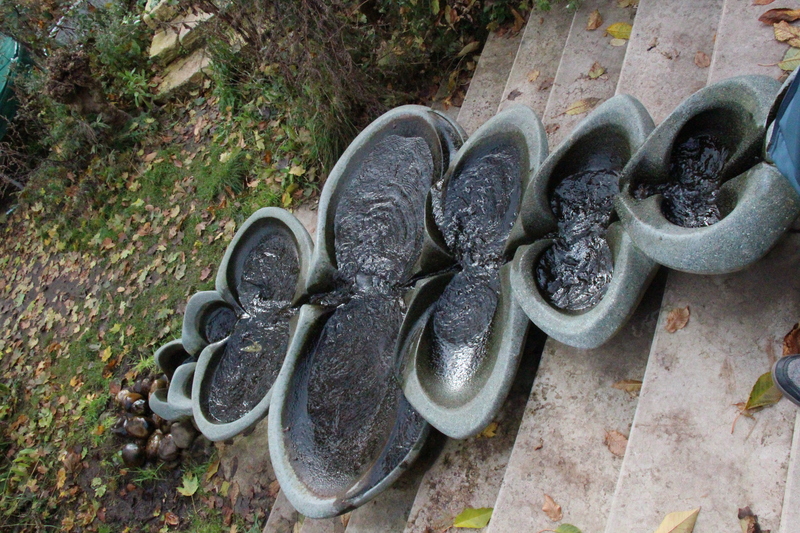 A fountain in the Mathildinhöhe garden. It was very relaxing in this area, and the number of fountains sure helped that. This one was calibrated on an almost metronome-like rhythm, with the water marking time swinging from one side to the other of each basin. 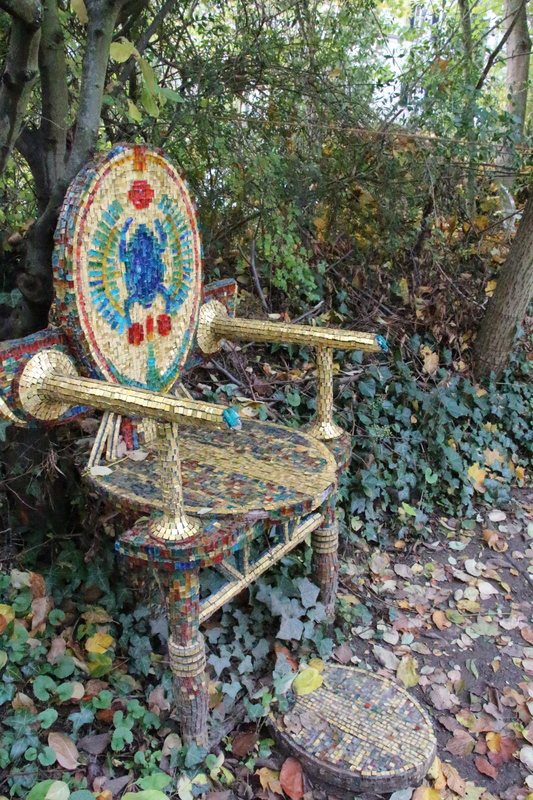 The throne of the garden. 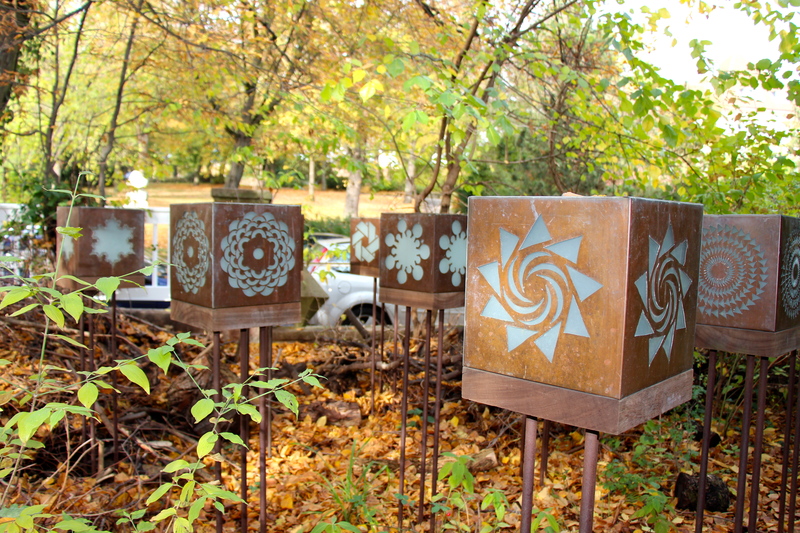 All around the garden were artistic designs on everyday objects: chairs, tables, lamps, lanterns, tiles, everything! 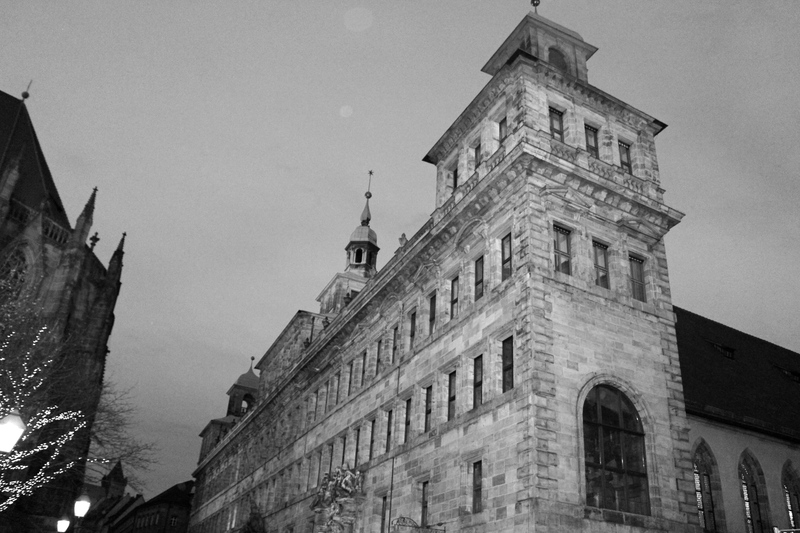 A building in the Künstlerkolonie, the area built by artists to showcase the integration of art into living space and work space. 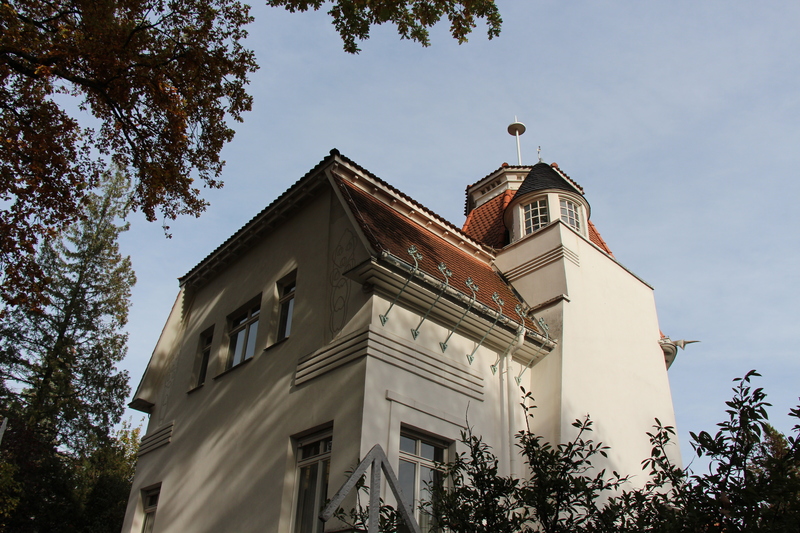 This particular one is Haus Dieters, and it is now a gallery in it’s own right. 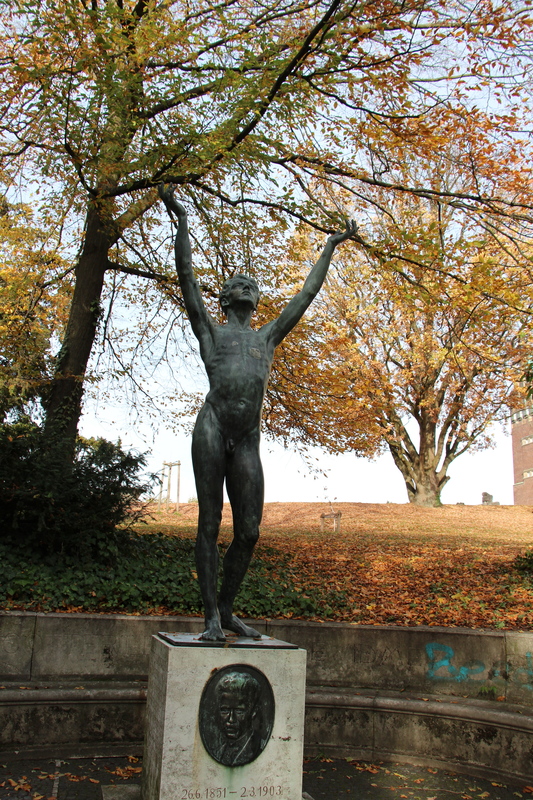 I loved how triumphant this figure is, against the fall colors and light… It’s kind of too bad it also makes me think of Vanna White. Oh well. 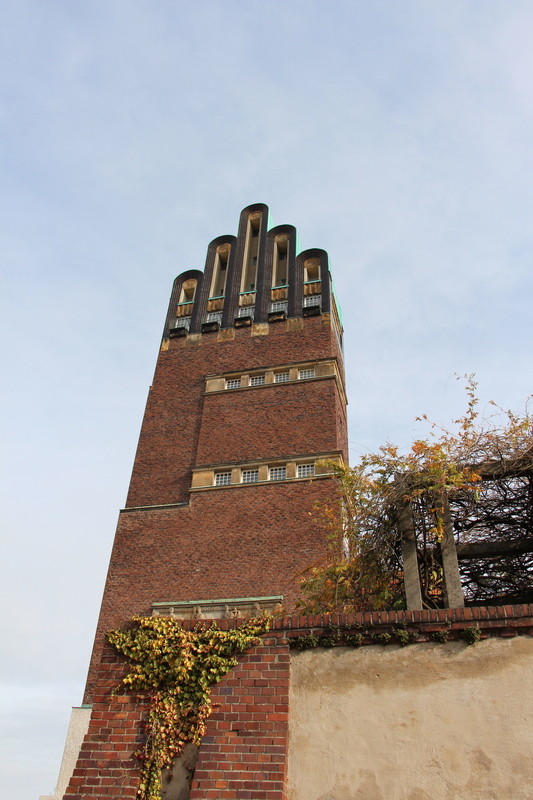 One of the most famous buildings in the Jugendstihl area, the Wedding Tower. 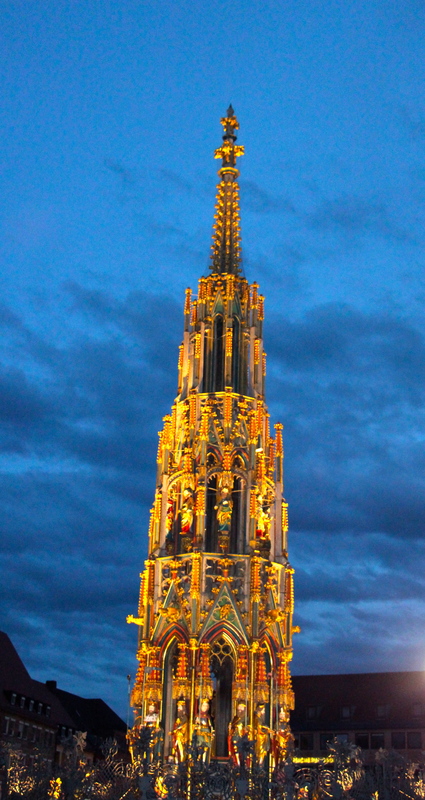 The tower was a wedding gift to the Duke, Ernst Ludwig, from the town. 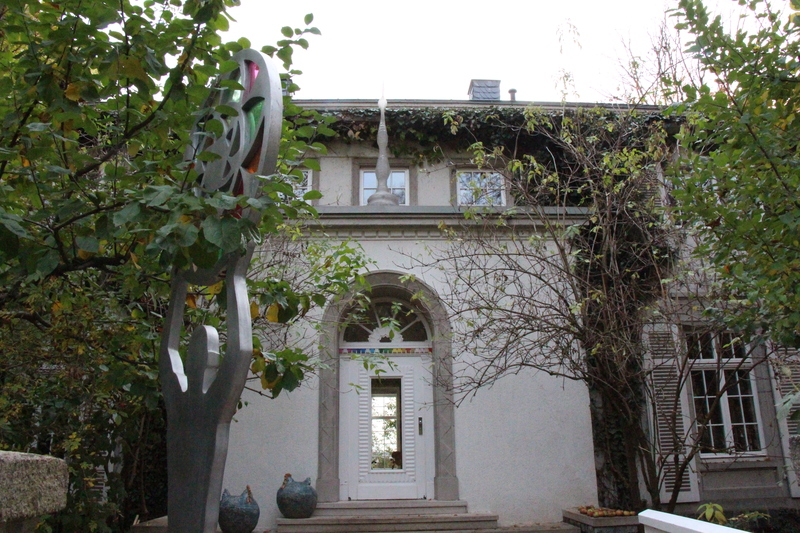 This is the Ernst Ludwig House. 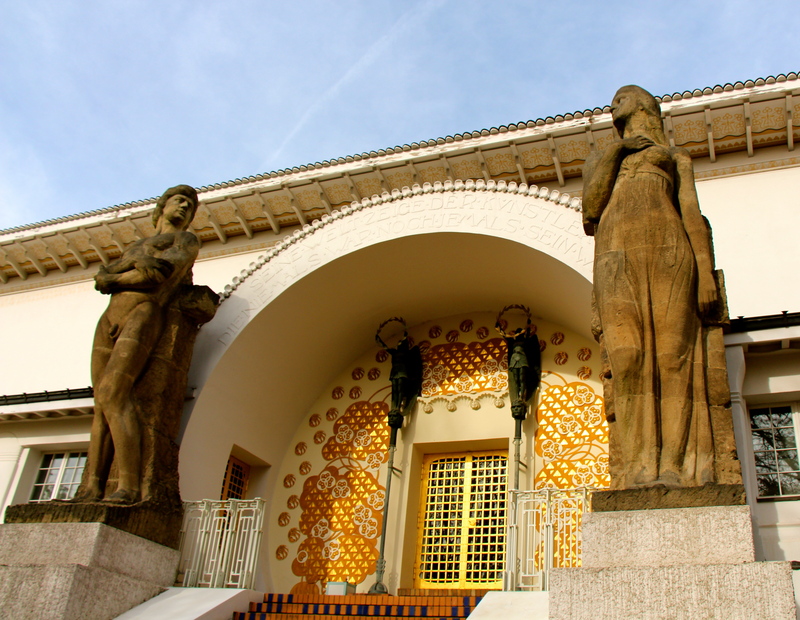 Originally, it was intended to be a “Temple of the Arts,” and is now a museum for Art nouveau exhibitions. Does it ever happen to anyone else that you just can’t find the rest of your pictures? I know that they are all right there, in fact, I was just looking at them when I loaded the above pictures, but now… the rest are hiding. 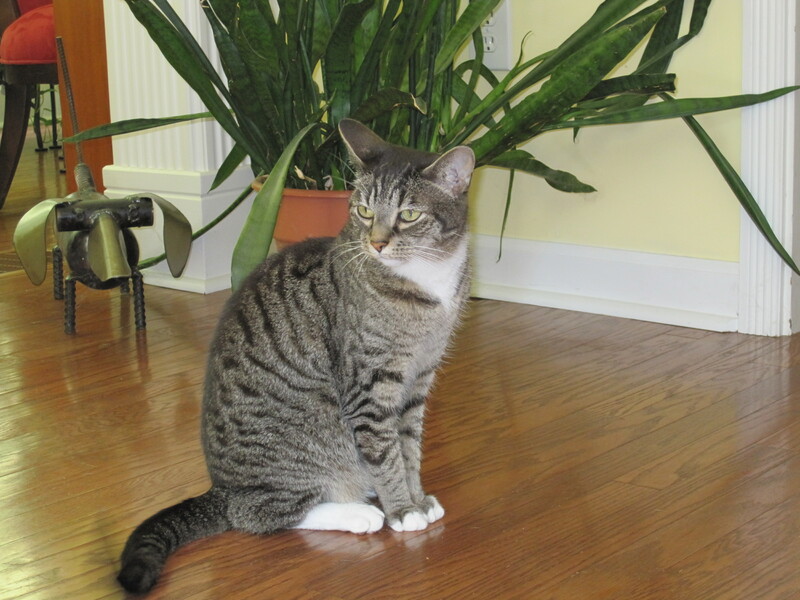 Perhaps I should just take a clue and end right there… Or perhaps, I should share another picture of my cat. 🙂 All of the sudden, I couldn’t find the rest of my Darmstadt pictures, but I could find all kinds of pictures of Kramer. 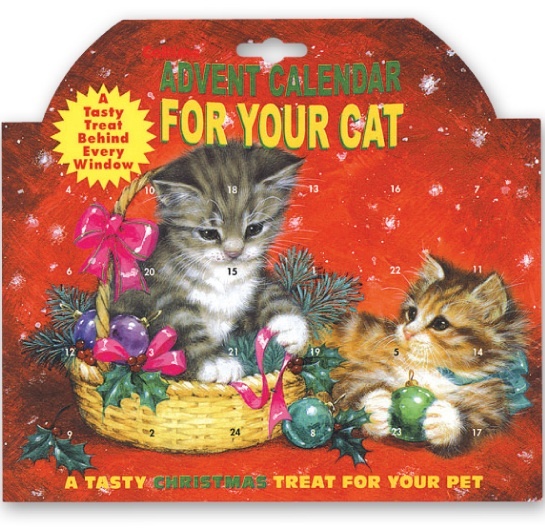 He’s been on my mind today… I went to the store earlier with a friend here, and I saw that they were selling Advent Calendars for the Katze! 🙂 How awesome is that? I figured that Kramer tends to be rather particular about what he should and shouldn’t eat, so I didn’t purchase it for him, but I wanted to share that it was there, so that his people looking after him (my parents) could show him that I’m thinking about him (not that he would necessarily care, but…). Kramer, like the Jugenstihl, is definitely in the young style, and is the perfect embodiment of life, art, and work. Just ask him. He is happy to share his wisdom. I am not a great movie watcher, by any means. I tend to judge movies based as much on their length (my enjoyment is directly inverse to the length) as much as by their content. I don’t like scary movies, and if a lot of people die in a movie, it probably isn’t for me. Mike, however, is very much a movie-kind-of-guy. Last weekend, he had reached his limit: we had to go see a movie. 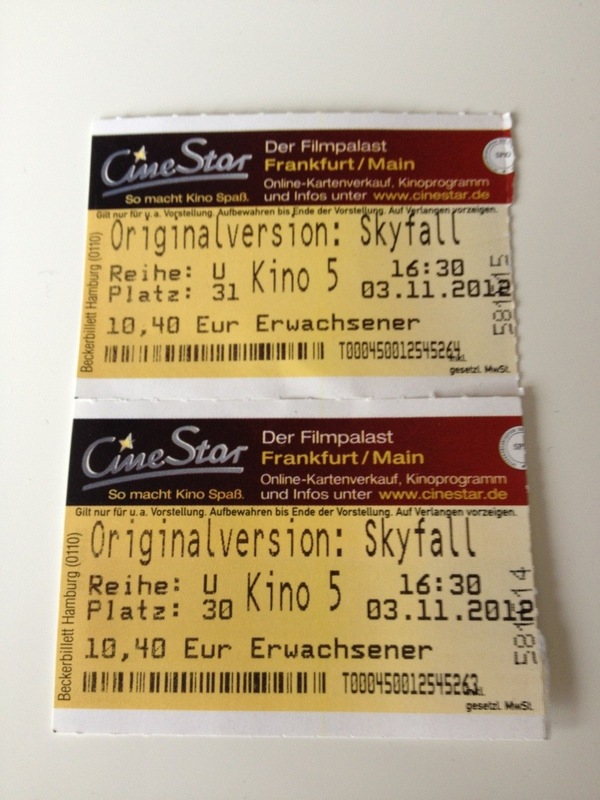 As luck would have it, the new James Bond movie was not only out here in Germany (apparently at least one week earlier than in the States), but there were a few showings where it wasn’t dubbed or subtitled. As a testament to how much I love my husband, however (or was it that he bribed me with Starbucks? ), we went to a movie. At 2 hours and 23 minutes, this is well past the length that I can comfortably sit still, but, like I said, I’m in this for the long-haul, so there are probably going to be a few more movies whose length exceeds their content (“Snow White and the Huntsmen,” anyone?). One of the things I really like about going to the movies here is that when you buy your ticket, they give you an assigned seat. We were there almost an hour before the movie started, but still ended up with seats on the 5th or 6th row. Even though we didn’t have great seats, I still liked it that I didn’t have to scope out the theater, angle for seats in the center, and all of that hubbub. I just show up with my ticket and follow directions. This, this I can do! We were in theater #5, seats 30 and 31, row U.
I have read numerous reviews, both of the professional nature and quick blurbs on Facebook (which honestly is where I’m also most likely to go on Sunday mornings these days to find out how college football in the US went on Saturday), and it seems that most everyone thinks that this latest iteration of the James Bond brand, “Skyfall,” is the best yet. I haven’t seen any others, like I said, but… if that one is the best yet, and there have been 22 others before it, a lot of people have spent a lot of time watching a lot of movie that neither seemed very exciting nor very compelling (to me). In fact, if we assume that the average length of James Bond movies is 100 minutes, many people have (or soon will) watched James bond for over 38 hours of their lives. Over a day and a half. That they won’t ever get back. (I know… I’m a real Debbie Downer about movies). Anyway… I also understand that I’m in the minority on this one. No need to convince me, I promise. Our “garden.” While it is nothing like the lovely (and productive) garden at our home in Atlanta, having plants makes me happy. We have grown Amaryllis for the last couple of years at the holidays, and this year is no exception. It is such an incredible thing to witness: a bulb emerging from the dirt into a bloom of exquisite beauty. We are not yet to the bloom stage, but we’ve only had the sucker for a week! Watch it grow! 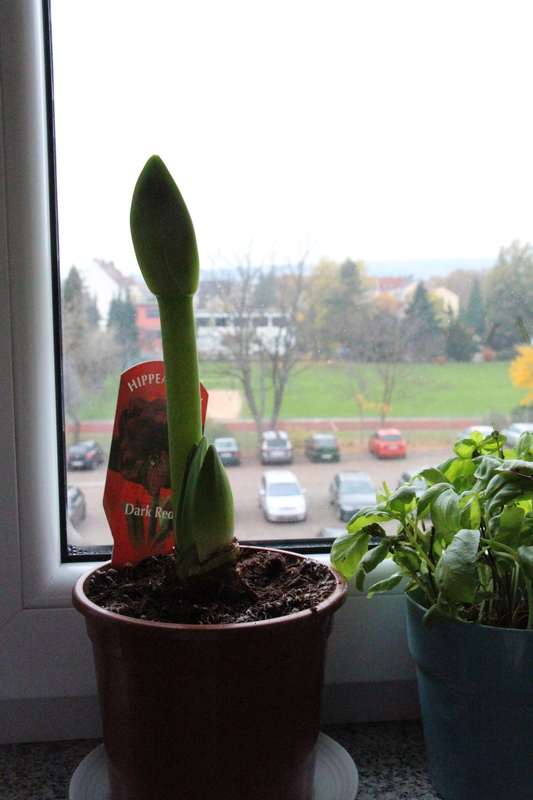 Picture #1, Amaryllis Day 2. 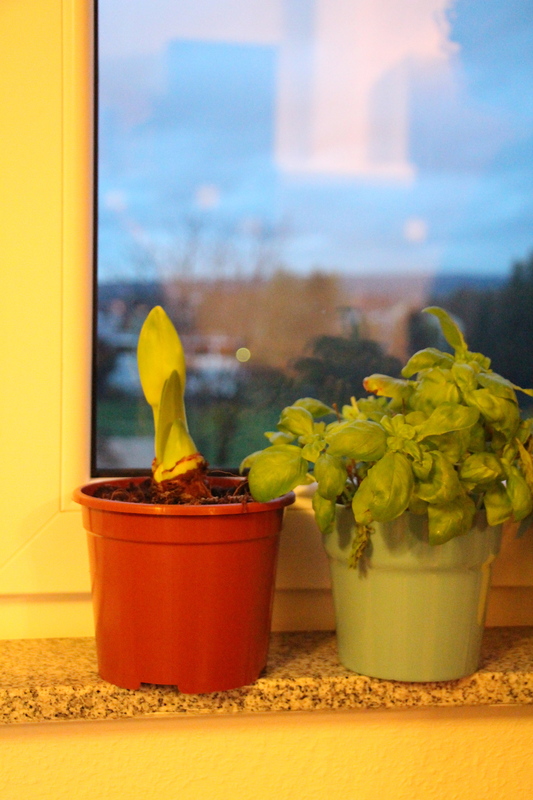 Our friend the Amaryllis is joining company with the enduring basil, and 3 mini-plants (including a rose bush). 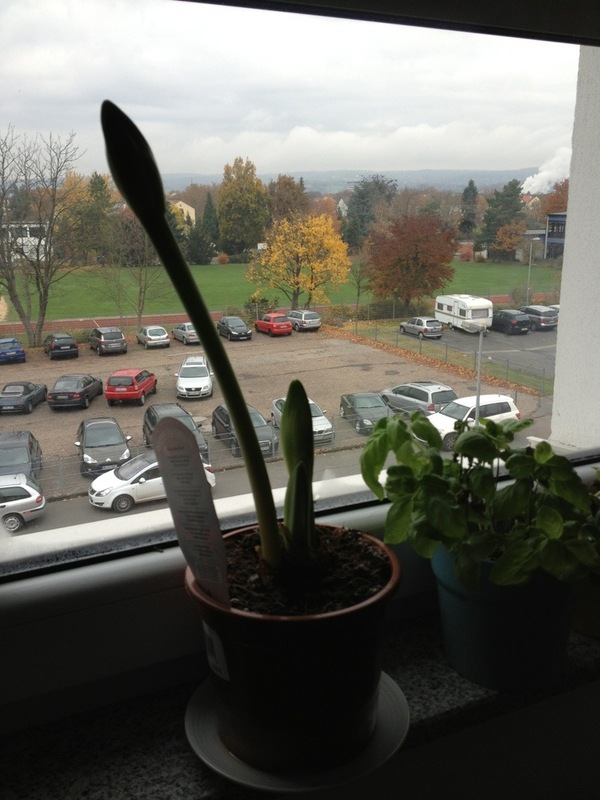 Amaryllis Day 7. Pretty cool, huh? Stage 1 – Assimilation – When we arrived in Germany, I honestly did not believe that I would have another pancake until I was back on US soil. 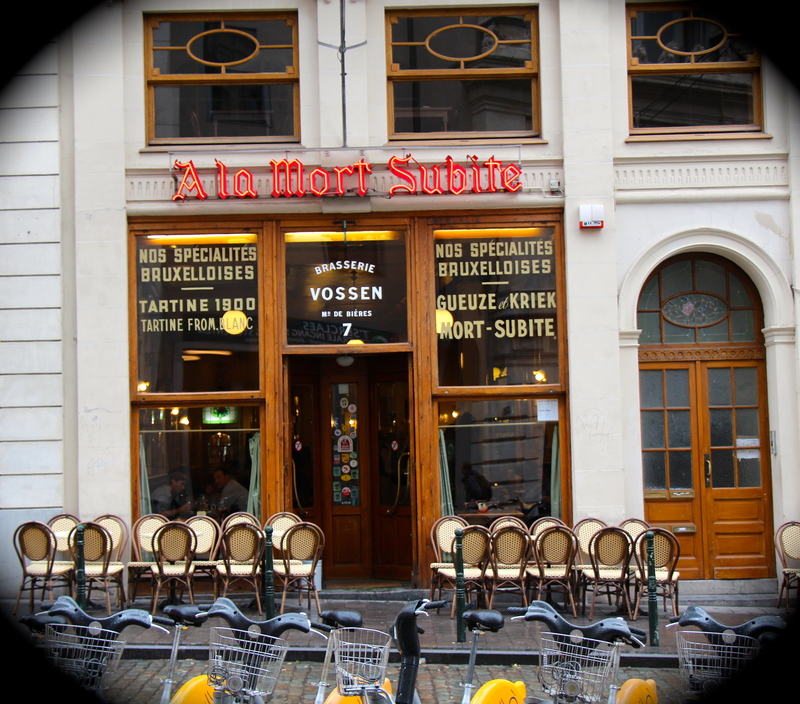 Rejecting the minority culture… I was fully expecting that somehow, I would grow to love having ein Brötchen (a bread roll) each and every day for breakfast. Not that I don’t like the bread rolls (I do), and I don’t doubt that there is significantly more variety than I am implying, either. Stage 2: Separation – Rejecting the host culture in favor of holding on to one’s own. Buying the big bag of all-purpose flour and trying to make it self-rising, regardless of the futility of this effort. 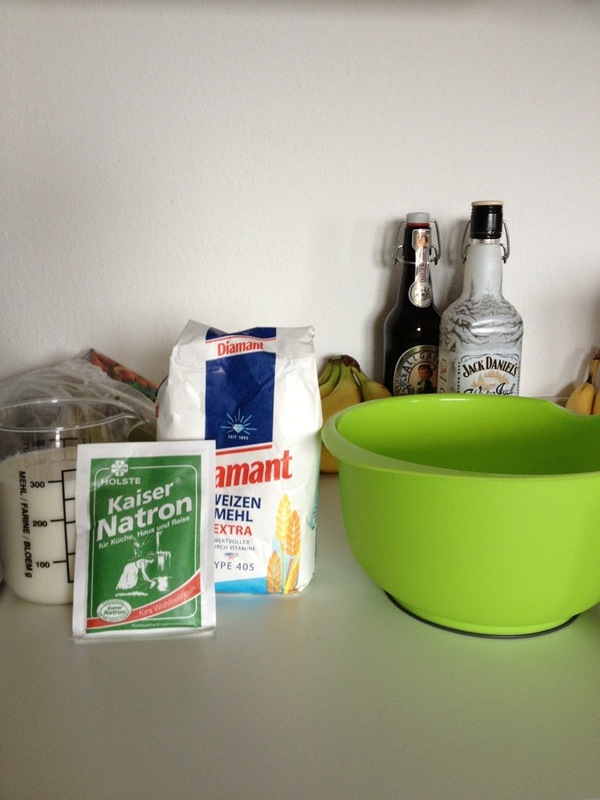 Stage 3: Integration – Adopting cultural norms (all-purpose flour) while maintaining one’s own culture of origin. Buying a small bag of all-purpose flour and adding leavening as needed for the recipe I prefer for pancakes. Stage 4: Marginalization – Rejecting both the host culture and the culture of origin. Giving up and going to the Asian grocery store. 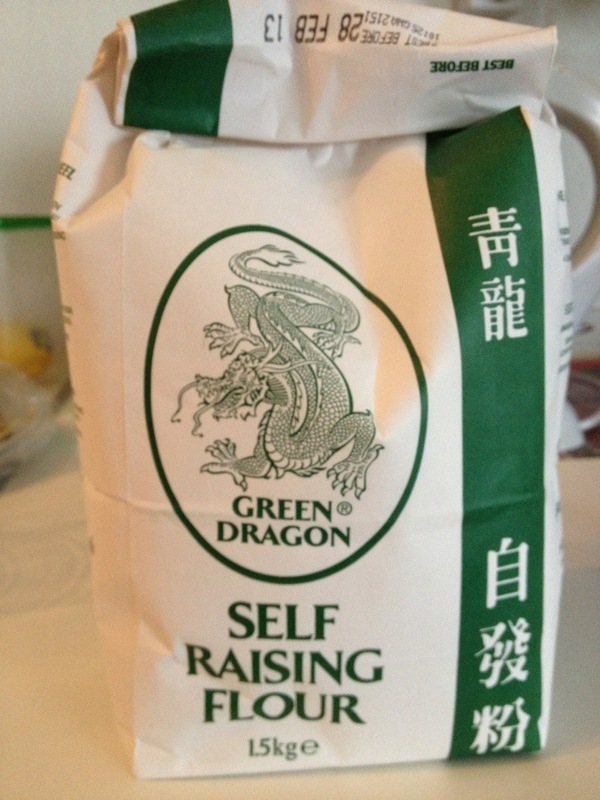 “Self-Raising Flour” Who needs White Lily when you have Green Dragon? From flour to pasta: With only one week to spare, we have our little excursion to Italy booked! Yippee!! We’re stopping at Neuschwanstein Castle on the way down to Venice, where we’ll spend about 1.5 days, and then to Rome for the rest of the week. (As I write this, I almost feel like my fingers themselves get excited!) I do hope that you will pardon my absence next week… You gotta do what you gotta do, and in my case, that is go to Italy! 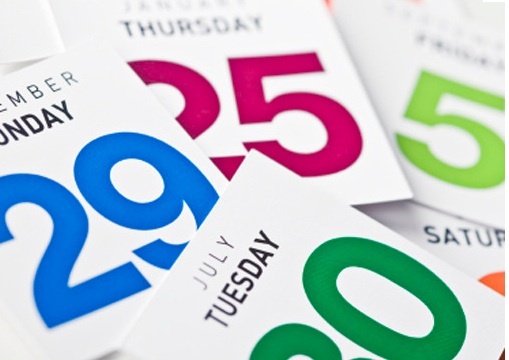 If you have suggestions of things to do or see, we’d love to hear them! 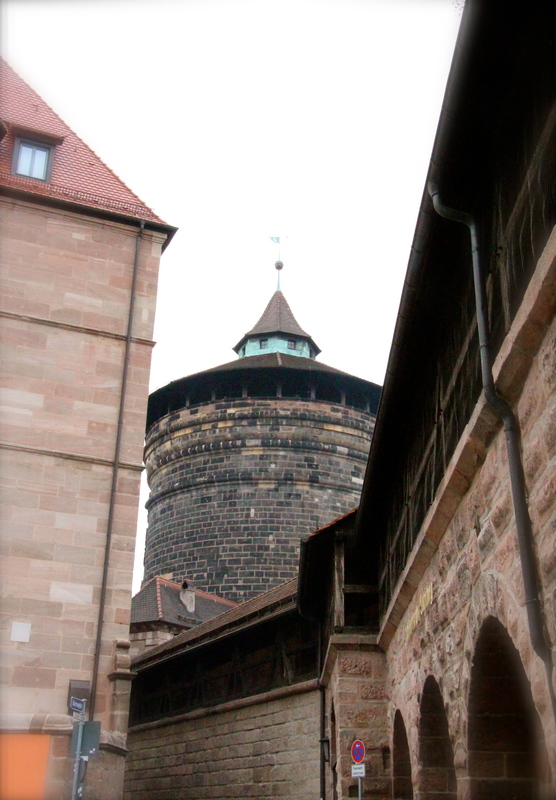 Was ist “die Burg?” Aschaffenburg!! 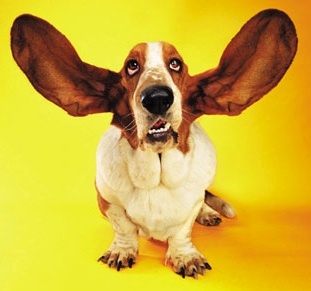 That’s me, minus the bassett-like face… All ears! Not to mention that I now have ALL of the ingredients necessary to make pumpkin cupcakes! 🙂 The last to arrive in our little apartment was the vanilla. I’ve heard mixed things about the vanilla here. 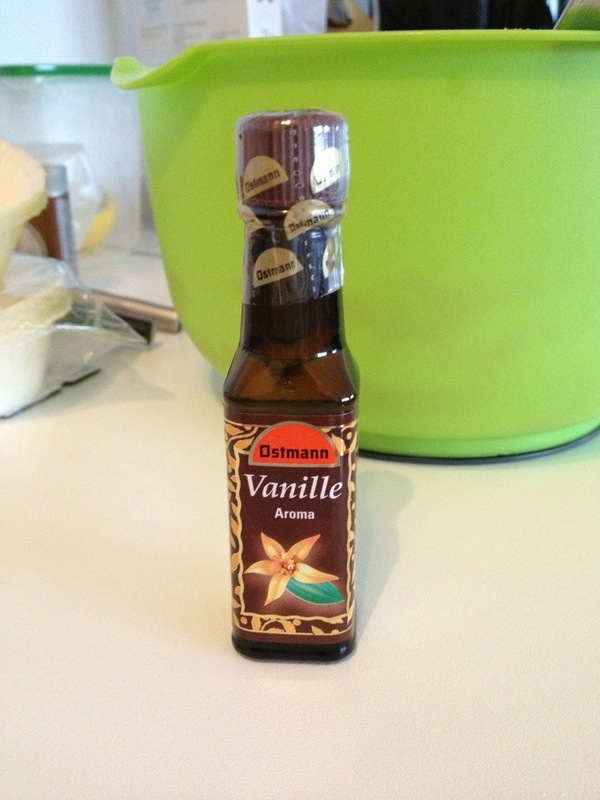 One of the ladies in the group here at the apartment building thinks that the vanilla here is the bomb! She’s adding it to everything: french toast, tea, coffee, probably even her lasagna (I don’t know that for a fact, however..). On the other hand, I’ve heard that vanilla here just isn’t the same and if I care about vanilla or baked goods, I should probably import it from the U.S. (strong opinion, indeed…). Well… I decided to “buy local.” They call it vanilla “aroma,” rather than “extract.” I feel like that is probably the gist of the difference. 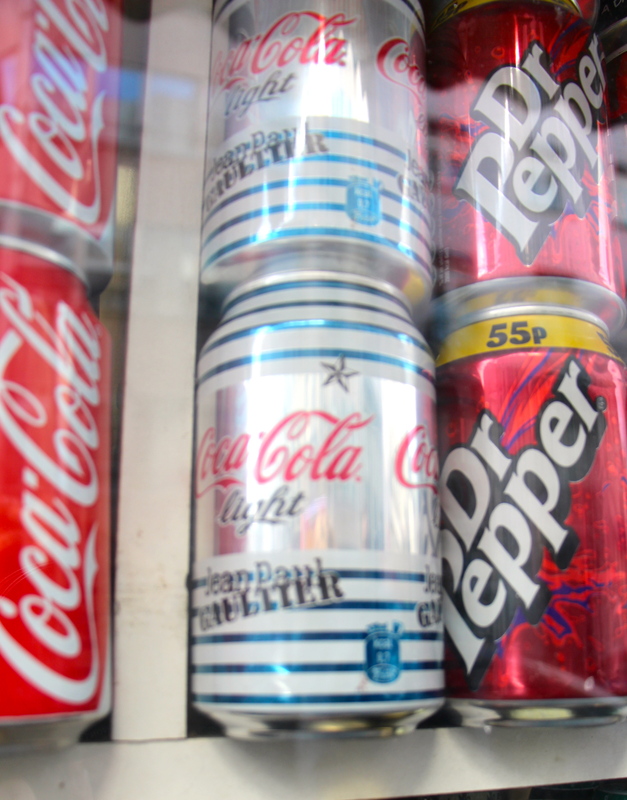 I also had the choice between buying it in very small packets vs. very small bottles. I opted for the bottle (ever the optimist, I am!). 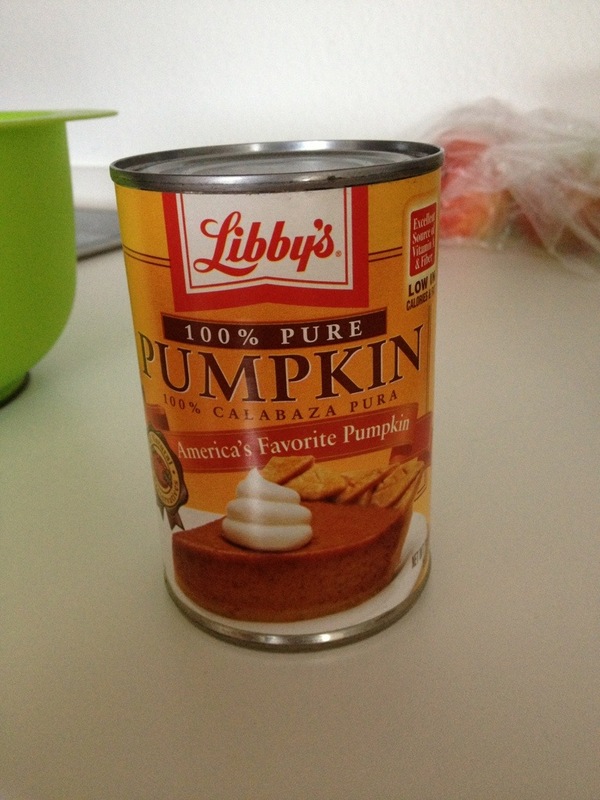 “America’s Favorite Pumpkin”: After looking high and low and most other places in between, I’m fairly convinced that this is the primary canned pumpkin globally, not that most people outside the US care about pumpkin one way or the other, especially in cans. The finished product! Not the most beautiful cupcakes I’ve ever made, but they sure are tasty! 🙂 FYI: if you don’t have a mixer, icing is hard work! 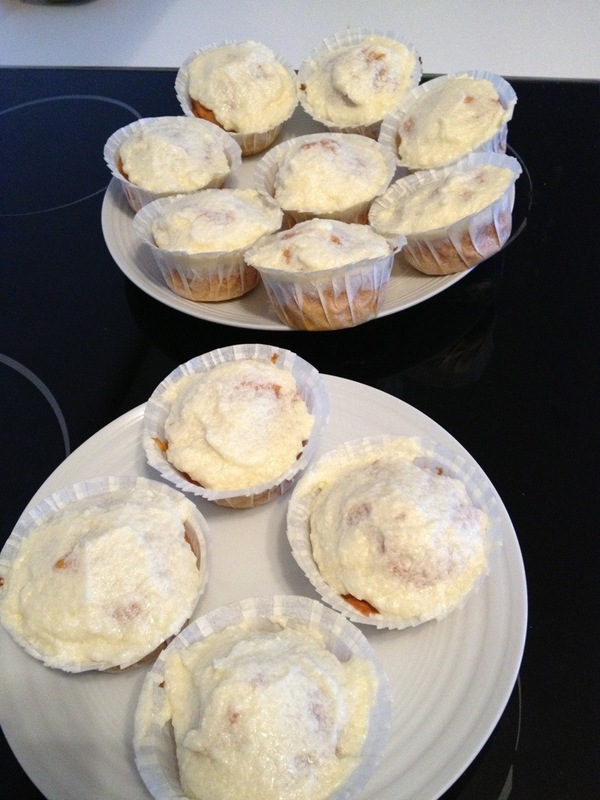 And… can you believe that the recipe produced exactly 12 cupcakes? I have never, ever had that happen! Wishing you a very happy Thursday, from our delicious-smelling home to your’s! Some of you may remember a few of these things, but I’ll start at the beginning for the sake of clarity. Last week, it was a pressing concern of mine to remind everyone, near and far, both those who are known to me and those of you who have just stumbled upon this blog, to ALWAYS, ALWAYS use roller bags, and documented my less than delightful adventure up and down escalators (which will break down in the event that you do not utilize your roller bag) and all around Frankfurt via my independent train adventure. All on a previously unrealized quest to take a particular test at a particular time in a particular place. 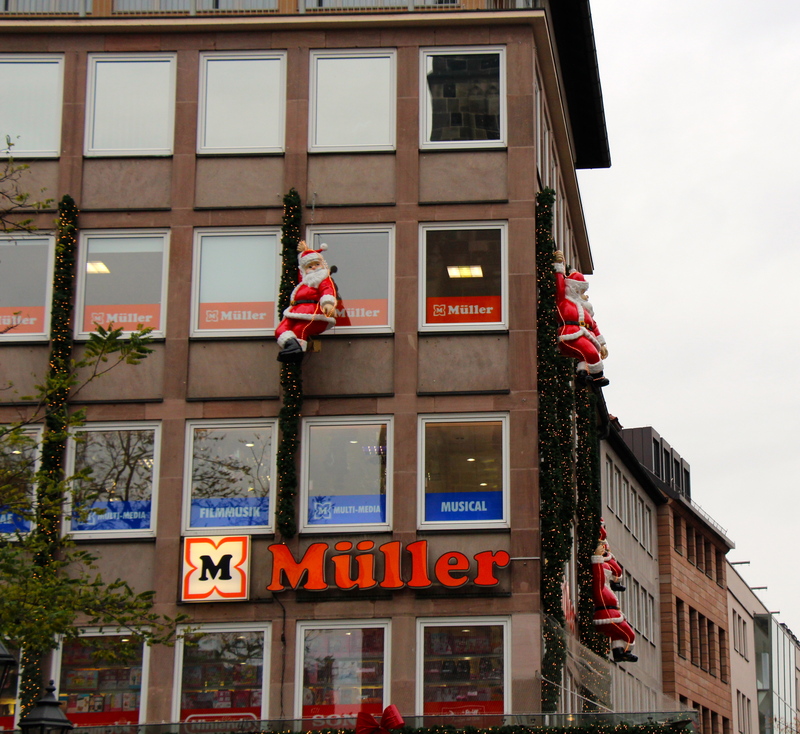 Yesterday, that particular test (the GRE) was taken at a particular time (7:30am) in a particular city (Frankfurt). This was NOT my original plan, but it was the plan that was going to work. On 0 hours of sleep, I set out to face down the enemy known as quantitative reasoning. It was at least 1/4! as much fun as it sounds… (That is my attempt at a nerdy math joke, by the way. I was not implying that I was really excited about it being a quarter of the fun that it sounds like it would be, but 1 quarter factorial, should you know how to expand that little equation.) I arrived, and after clarifying with the nice man behind the desk that Mike had dropped me off in the right place, and that I did not, in fact, speak German well, I was off. To the cafe for a cup of something with caffeine. And then to take the test. 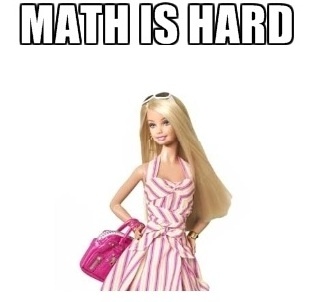 Rather than put you through the pain of my morning, I’ll summarize by saying that math is hard (just like Barbie says…). And of course, I got an extra math section (they always include an extra section for “research,” and I was not all surprised, given the no-sleep situation, that mine was math). But… all in all, I didn’t feel too terrible about the whole thing. After completing the question, you go through a series of questions asking you what you want to do with your scores, and then you see your scores (less the scores on the 2 essays which are reviewed later). You know that dream? The one where you are sitting at a desk, taking a test, and it’s written in Chinese but you don’t realize that it’s in Chinese so it is very confusing, and you have no clothes on, and there is a spotlight shining on you and an audience of thousands is pointing and laughing at you, while you are sitting at the desk in complete confusion and humiliation? Oh! You don’t have that dream?! I do (who said insomnia is a bad thing? 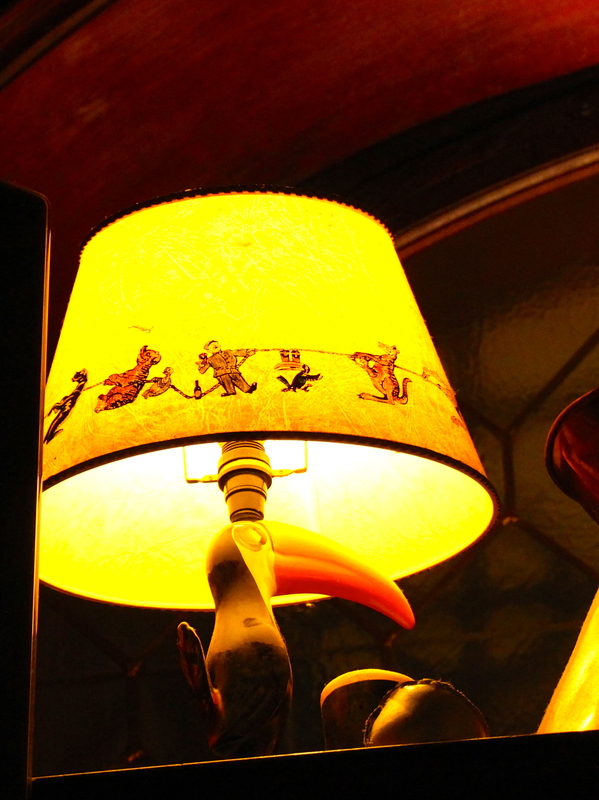 With dreams like that, insomnia sounds like the better deal, n’est pas?). 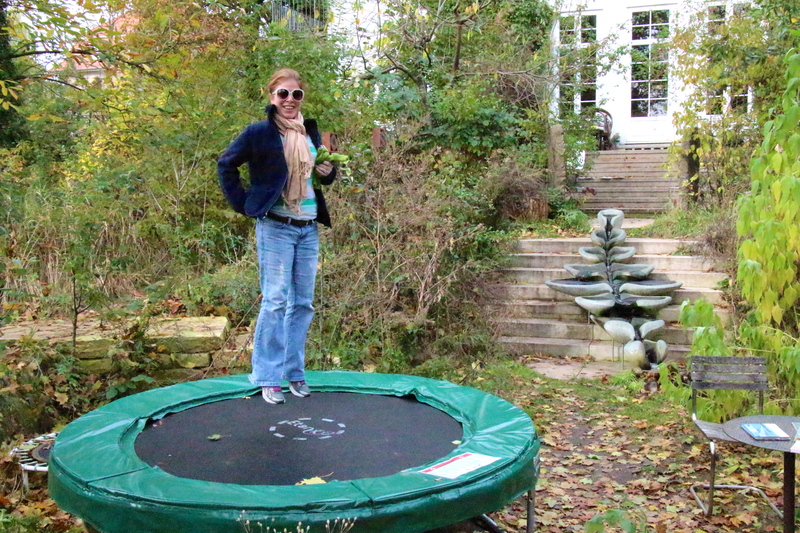 And I felt like it was happening – IN REAL LIFE – this morning! I saw my score, and then I rubbed my eyes (I was wearing my contacts for the 3rd time in the last couple of months (blindness is ok with me, I guess) thinking, surely, it isn’t that bad?! But it was. My scores were exactly what it said that they were. Immediately, tears rushed into my eyes. All of those people in my dream? They were falling out of their chairs, they were laughing so hard. I maintained composure, at least nominally, and exited the testing room. The very nice man who had checked me in was on a smoke break, and his replacement didn’t speak English well enough (and my German just wasn’t there with no sleep and that much math; there is only so much room in my brain, and the spot that German language goes had been squeezed out by the circumference of a circle formula) to tell me where the nearest train station was located (Mike had thoughtfully dropped me off at the start of this disaster). He encouraged me to go downstairs and ask the lady. The lady was thoroughly annoyed that I was in her office, it seems, and told me that the train station was out the front door. Which was true, in her defense, plus or minus a couple of kilometers and a few turns. Walking out the aforementioned front door, into a blinding rain storm (well, maybe not blinding, but it was pouring) without an umbrella, the tears came in earnest. At that moment, I felt that my worst fears had come to pass. I was a confirmed imbecile. And it was raining. And the lady knew that I was a confirmed imbecile and had treated me like I wasn’t worth the space in her presence. I did what anyone would do in a similar circumstance. I cried all the way to the train station (but it was raining, so it didn’t look so weird; given the insomnia situation, I had also flaked out of any real effort on getting ready, so there was no make-up to streak; who knew I was such a planner? Such foresight!). And past the train station. And back to the train station (the lady’s directions left a little something to be desired…). And then, I pulled myself together, got out my Kindle, and read. Nope, not too stupid to read (yet). Fortunately, the 1st train ride was rather long, and the train was rather busy, and the book was quite good (“In the Garden of Beasts” by Erik Larson; I’m not through with it, but I would recommend it so far…), and a sit-in at a certain international coffee chain was on the agenda for the afternoon. So… much to my surprise, given my newfound lack of intelligence as measured by a standardized test, I found my way across 2 different train lines from the ffffaaaaaarrrrrr side of Frankfurt to my little burg. 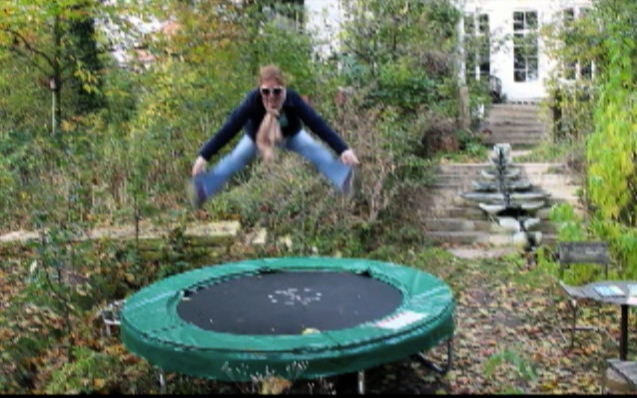 The video is really, um… “precious.” I’ll work on figuring that whole editing/uploading thing out… In the meanwhile, I wish you more trampolines (wherever you find them) and less tests! You know what is fun? Whatever you think is fun (to each their own, I say) + this experience: Mike and I went to the Real on Friday (a Target-like store filled with everything from groceries to china to electronics to clothes, but organized in a less frantic fashion than at, say, Wal-Mart) and when Mike put my little treat up on the conveyor belt at the cash register, 2 women (who didn’t know each other) both turned around and appreciatively eyed what we were getting. It’s a look I’ve worn before, so I know it well. This look isn’t quite jealousy (these looked to be lovely ladies not bitten by a green-eyed monster at all), but it is appreciation of the I’m-putting-this-on-my-Christmas-list variety. What was I getting you ask? Prepare your Christmas list! Christmas, like daylight savings time ending, comes early in these parts! 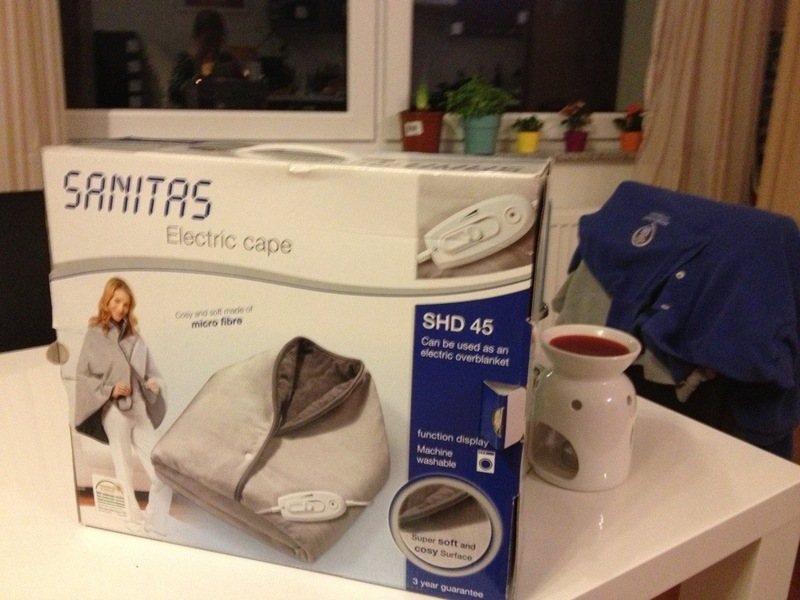 Just what I’ve always needed and I just didn’t know that it existed…. 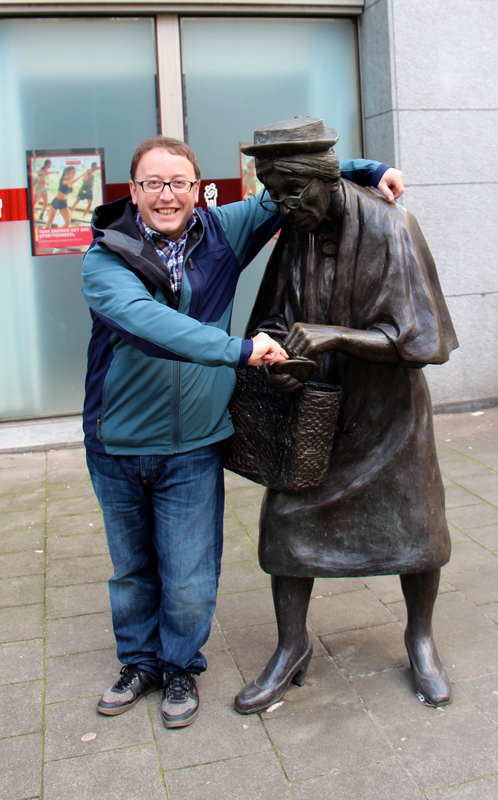 And you may enjoy carrying on with some more photos from our trip to Brussels, placed here, again, not for your jealousy, but for your appreciation! 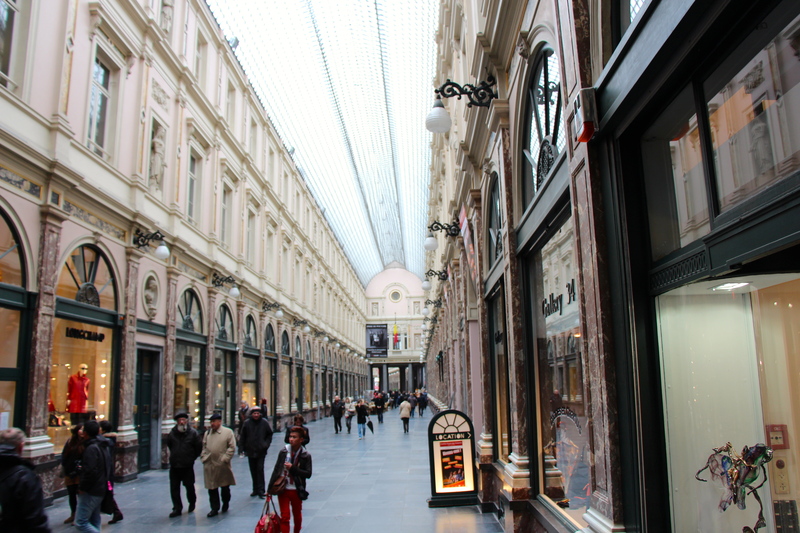 Brussels’ version of a shopping mall: Le Galeries Royales Saint-Hubert. 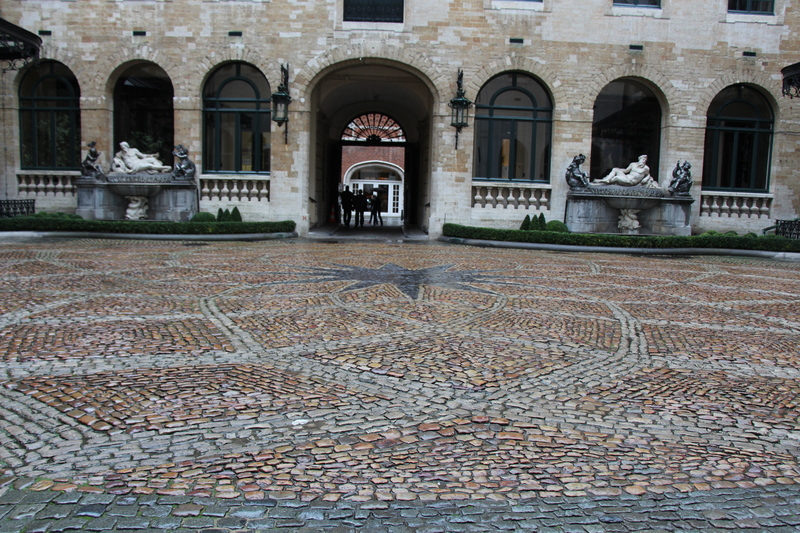 The courtyard inside le Hotel de Ville; the cobblestone star you see here is the point from which all distances are measured in Brussels. 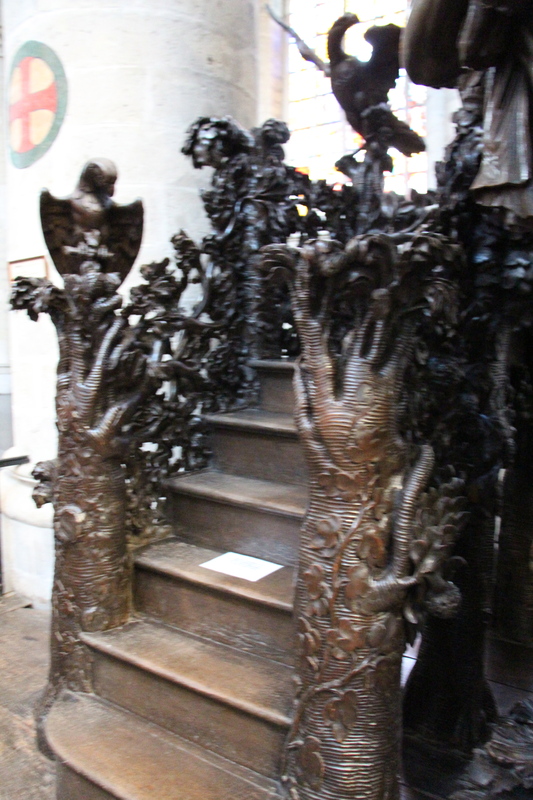 A replica of the statue of Everard ‘t Serclaes; touching this statue is supposed to bring you good luck (and if you touch his arm, it is said to ensure your return to Brussels). 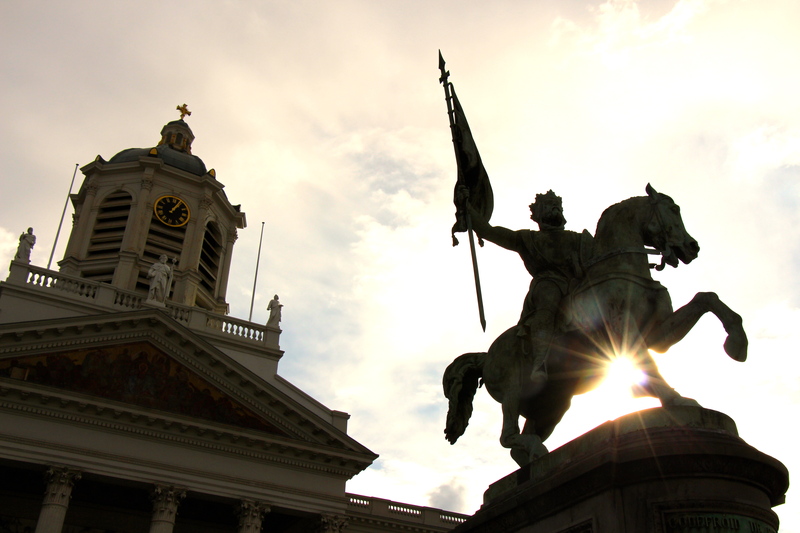 This guy is important to the Belgians because he led a band of patriots over the city walls to defend Brussels from the Flemish in the 1300s. He was later assassinated because he defended the city against the Lord of Gaasbeek (Dutch), and I guess the Dutch must have won. Later on, though, the Lord of Gaasbeek’s castle was destroyed in revenge for his killing of our dear Everard. 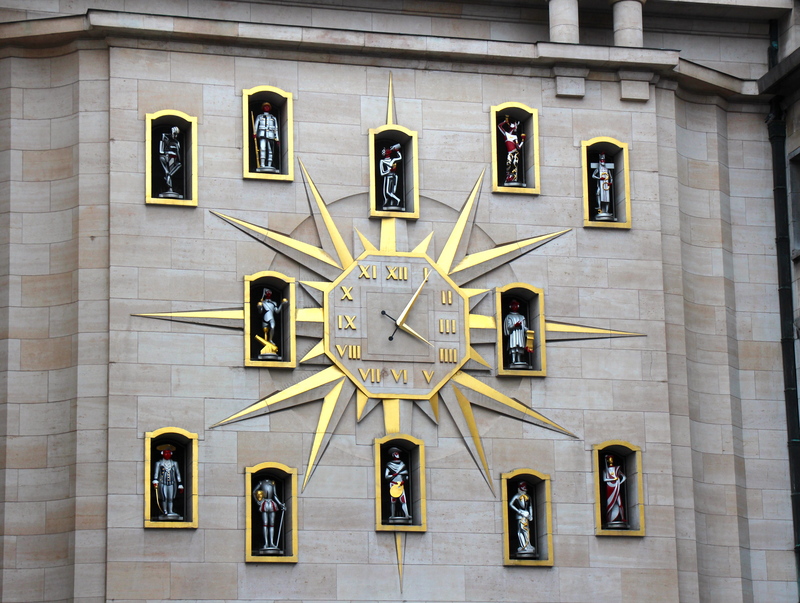 Cool clock over a road tunnel going through the heart of Brussels. 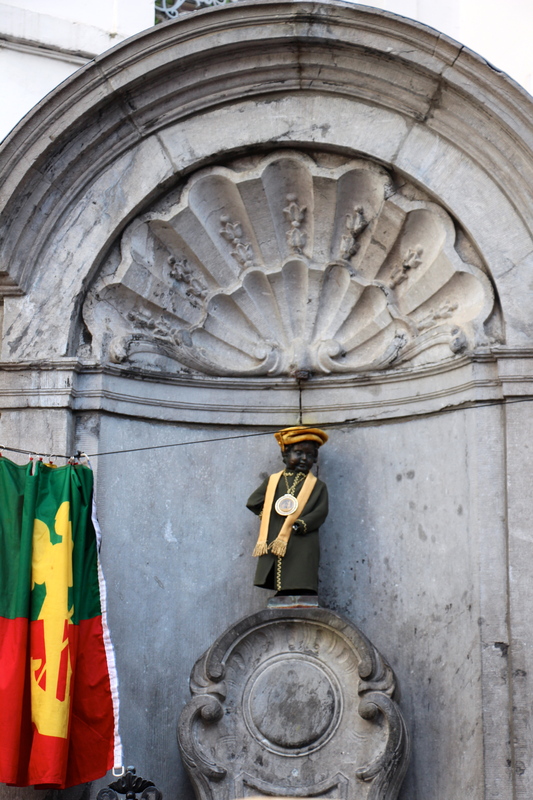 We stood amid the crowd for about 45 minutes waiting for the grand unveiling of the Mannekin Pis (literally translates to “Little Man Pees”) wearing his new clothes. They change the outfit he wears regularly, but we totally lucked out on getting to see the new outfit. 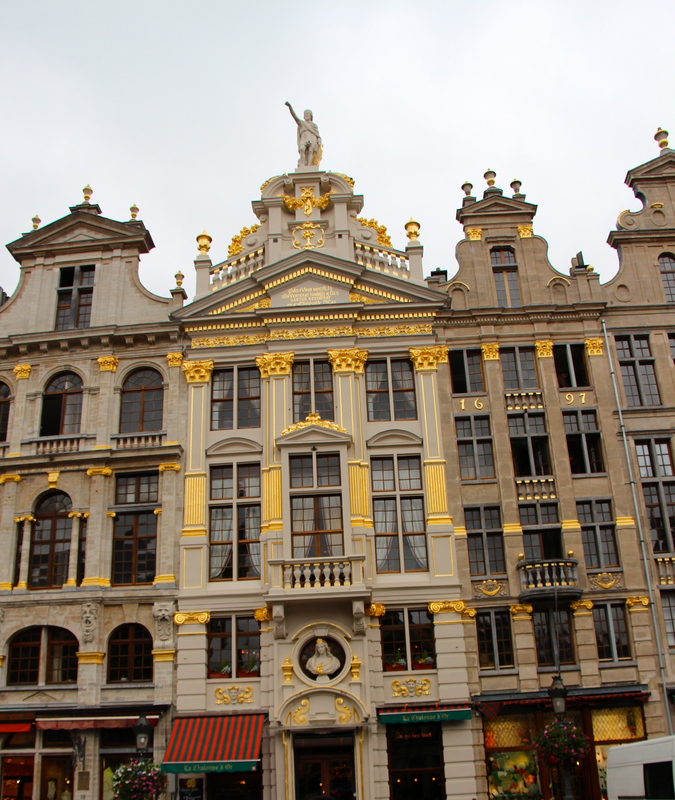 In preparation, they poured a bunch of little cups of beer for distributing to the group, and then a bunch of people wearing the big people version of his clothes came out and all toasted the Mannekin Pis in all of his peeing glory. It was, actually, very exciting. 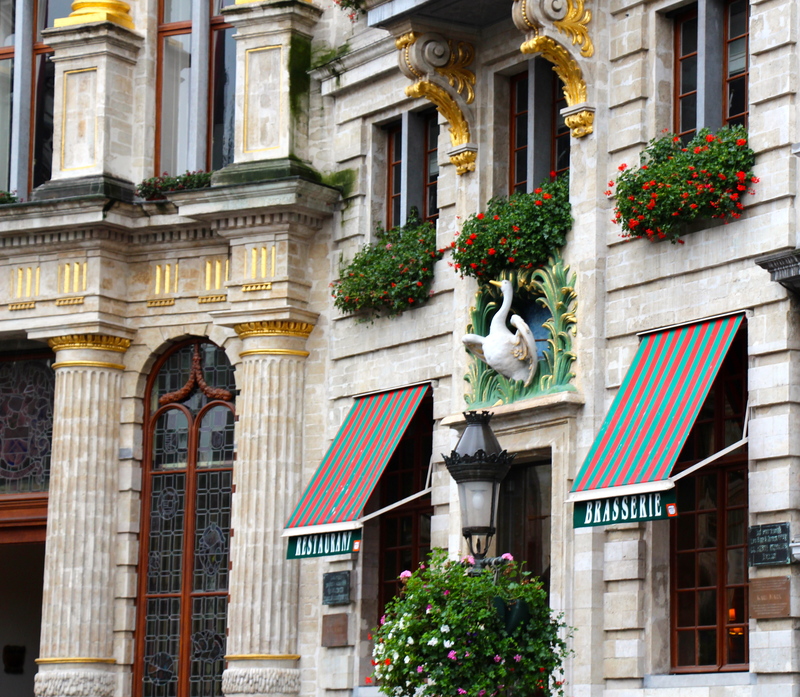 There are a bunch of legends about the Mannekin Pis, but basically, it is a statue that has been around for several hundred years (although it has been replaced a few times because it has been stolen or marred; the original sits in the Maison Rois at the Grand place). One of the legends is that there was an army in the name of a 2 year old “Lord”, and they had the baby in a basket as they went into battle. They hung the basket in some trees so that they could see the baby and be motivated by their “leader” and the leader then peed on them and they lost. Another legend (and the one usually told to tourists) is that their was a wealthy person visiting the city when is son went missing. After a search party was formed and sent out throughout the city, the young boy was found doing his business in a garden. They wealthy guy then had a statue built and donated in his thanks for the people who helped find his son. You pick! 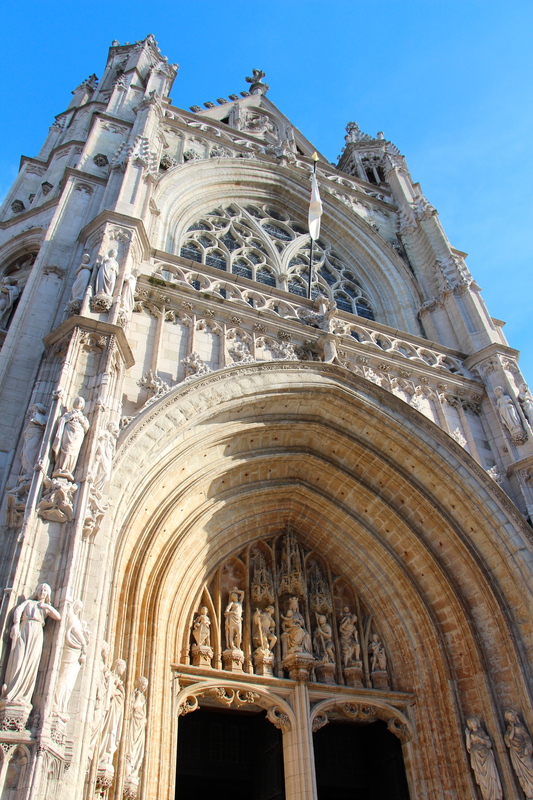 Notre Dame au Sablon… perfect weather (if a little chilly) and amazing architecture. 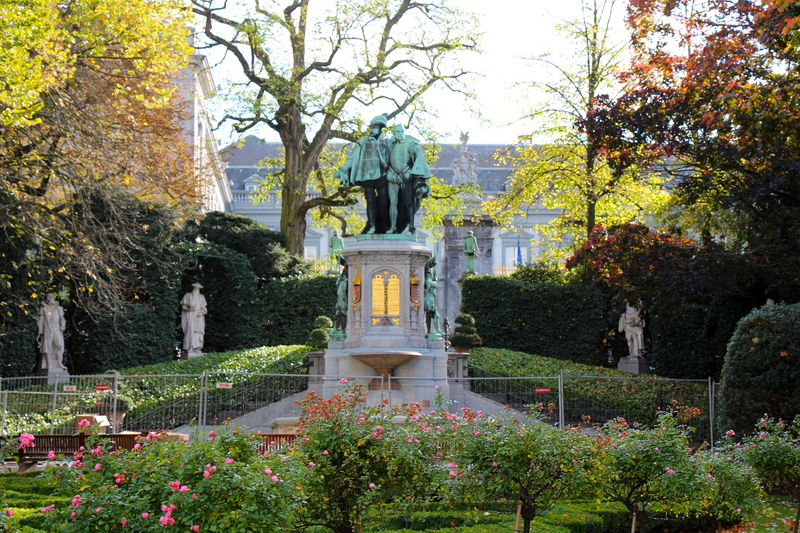 Le Petit Sablon: A small park next to Notre Dame with 48 statues representing each of the 48 medieval guilds in Brussels. 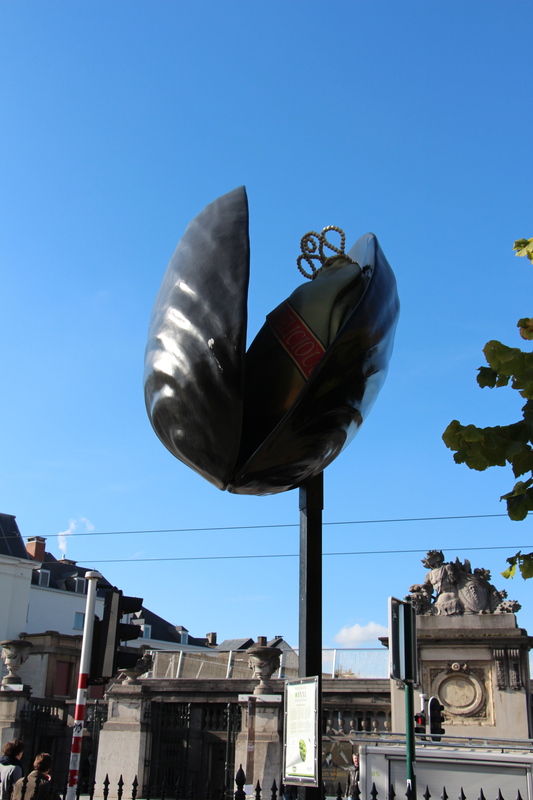 Place des Martyrs, memorializing the dead of the “September Days” of the Belgian revolution in 1830 (during which they won independence from The United Kingdom of the Netherlands). 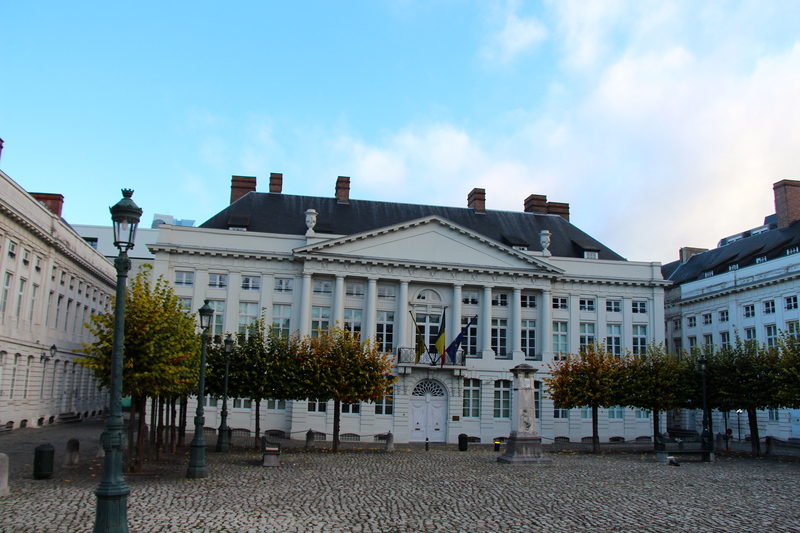 The middle of the Royal Square, where the Coudenberg Palace once stood. 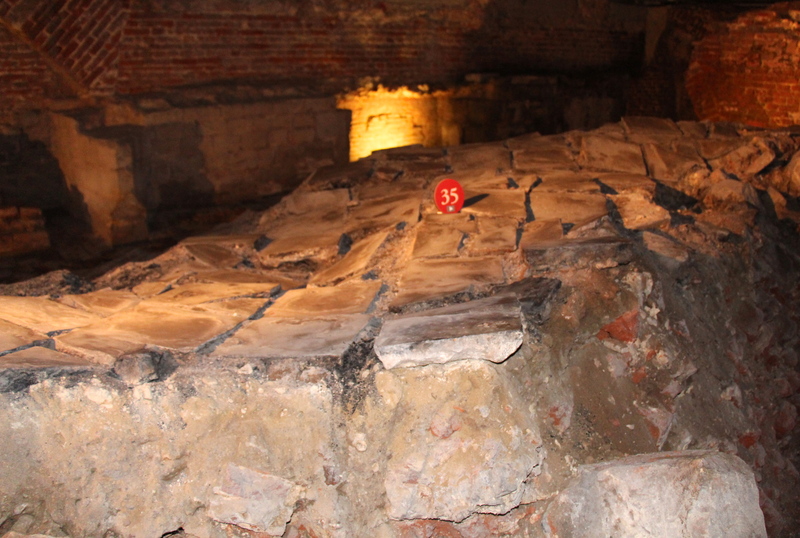 The archeological remains of the dining room in Coudenberg Palace. 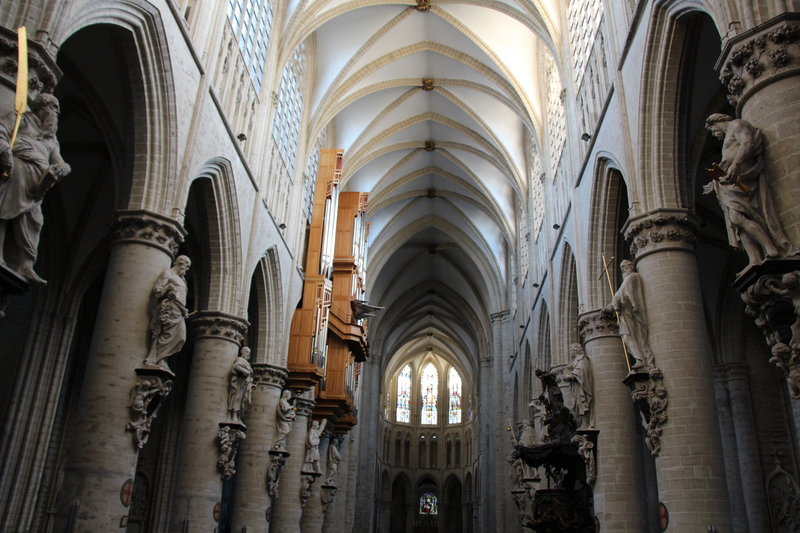 Coudenberg was the royal palace (and the place to be) from the 12th century until a fire (which started in the dining area) burned it down in 1731. 40 years after it was destroyed, it was basically covered up when they decided to try to level the ground to build the new palace. None of this was dug up until 1986! The black you see in between the bricks and such? Ashes from the fire… Cool stuff! 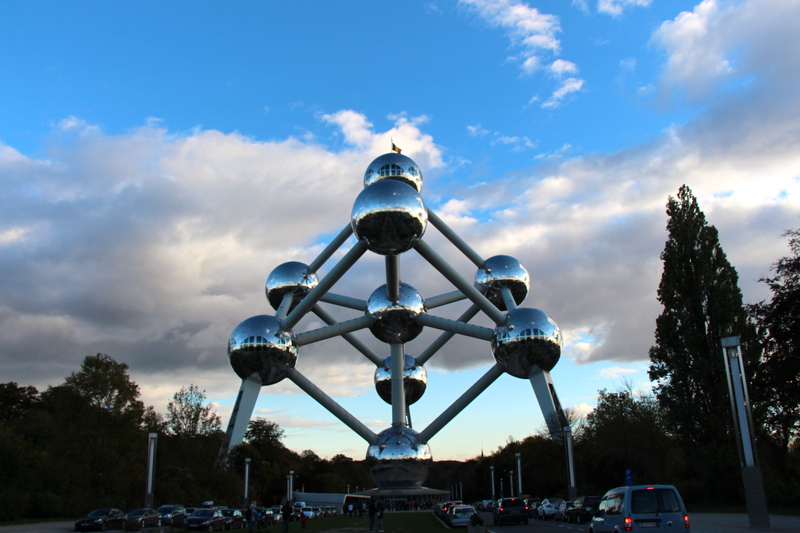 Approaching the Atomium, built for the 1958 World’s Fair. You take an elevator up to the viewing platform on the highest sphere. They will rent you other spheres… I’m thinking it would be a good place to have an office. What would you do with a sphere of your own? 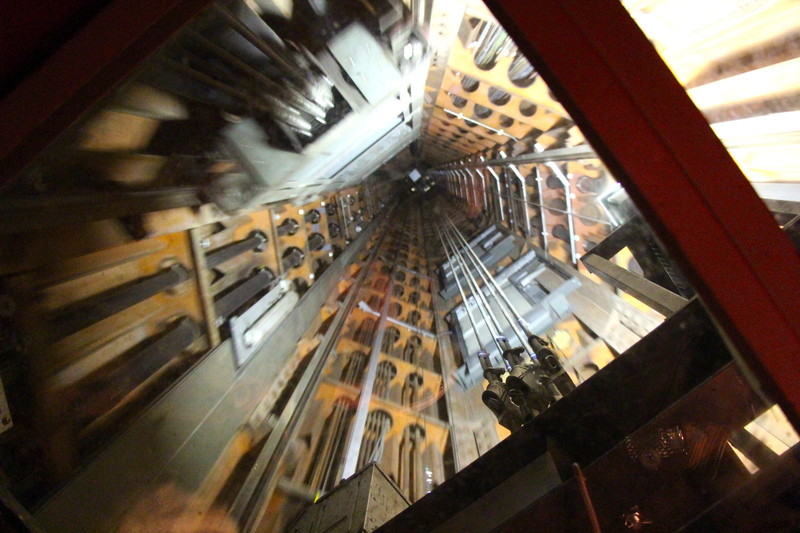 Zooming up the elevator to the viewing platform for the Atomium! Mini-Europe from the Atomium. 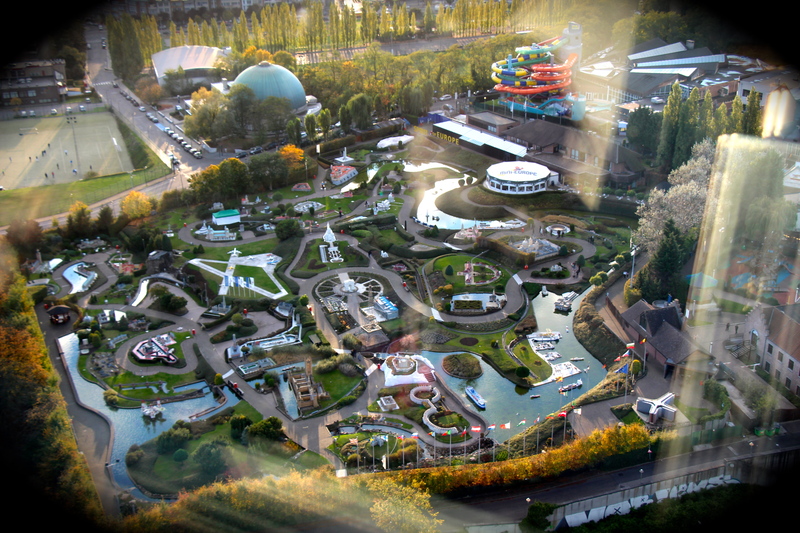 In case you don’t want to bother say, going to the real Eiffel Tower or going on a real canal in Venice, there is a clever amusement park where you can take in all of the miniaturized versions of the “must-sees” all over Europe. 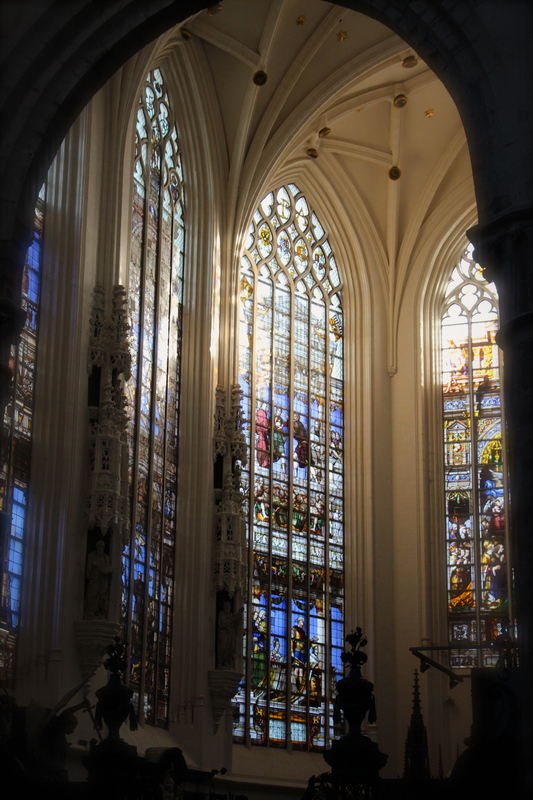 This area completely took my breath away… Completely. 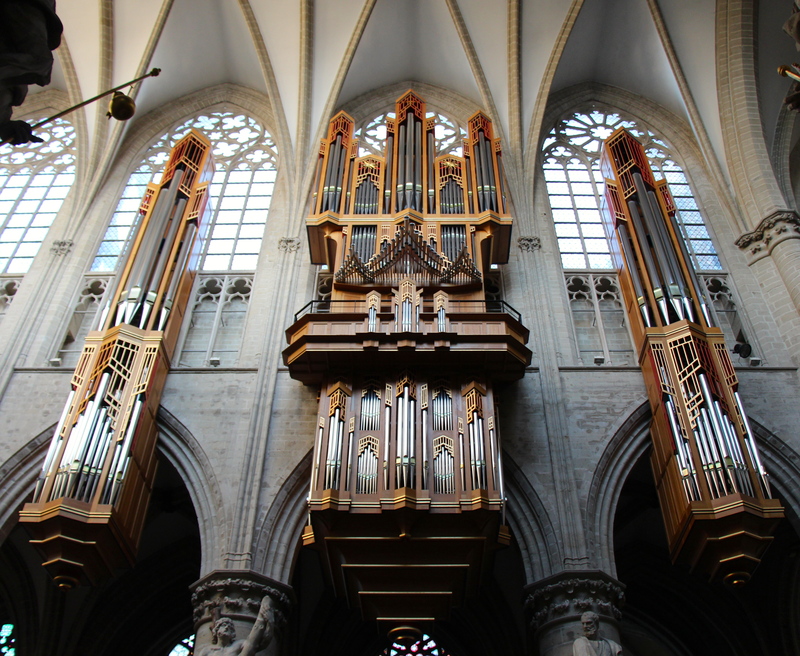 Some kind of organ, huh? 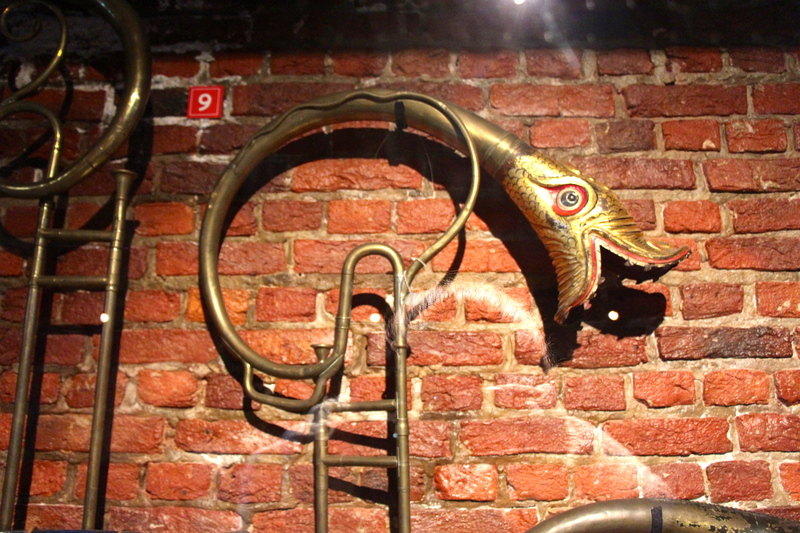 this is how trombones looked a couple hundred years ago. Progress? I think not. 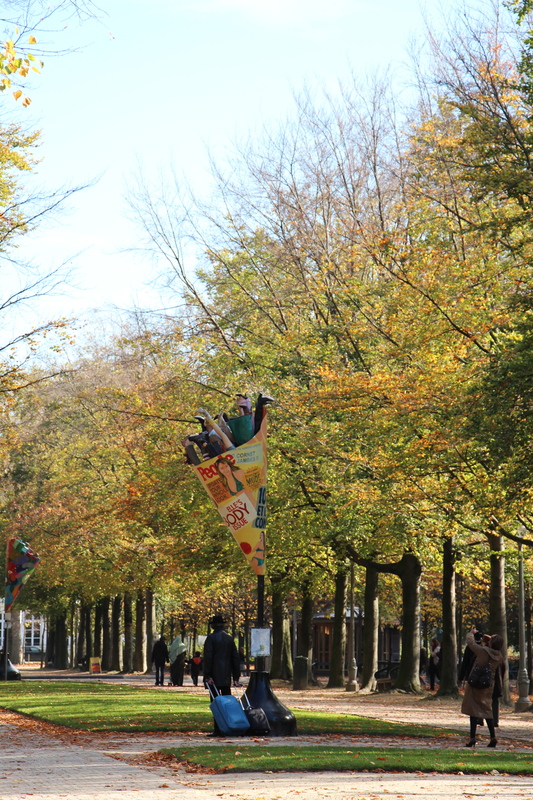 Our first (and last) “taste” of Brussels was in this park, with monuments to all things Brussels. First, of course, is a toast to their beer. And lastly to the mussels (which we did not partake in)… Fresh of the North Sea, they sure are proud of these guys! I must confess that the challenges I’ve had in posting this blog almost made that cape necessary: our internet has gone somewhere around 1/3 the pace of a snail since Friday. I’ve been writing this blog since Friday morning… It is now mid-day on Sunday afternoon, and it is finally, finally ready to publish. Thank goodness for that cape, or I’d be downright grumpy by now. 🙂 I’m not! The last time we had pancakes, we ran out of our homemade self-rising flour. And you know what an ordeal that was, right? Right. Me too. I had a grand plan about getting new self-rising flour – the real deal, but Sandy foiled that plan, too. She’s such a pain. But anyway, we still had no self-rising flour. Yikes! So… we needed a new plan. We decided that we weren’t going to commit to making a whole bag of flour at a time, but we were still going to make pancakes. After an emergency run to the market at the train station (open on days that nothing else is open and at times when you realize just after you get back from the store that you have forgotten something and your grocery store would close before you would be able to get back there), we had the good old all-purpose stuff, which would be the foundation of our pancakes for the holiday. 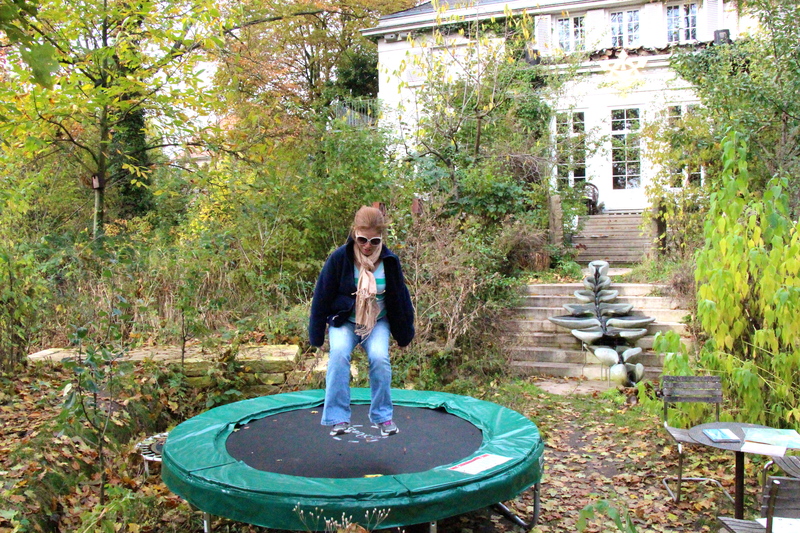 But then… eek! We are out of back pulver (baking powder)! Uh oh… are you imagining the Great Pancake Disaster of 2012 like I was? Almost 2 months in… We got this. Right? 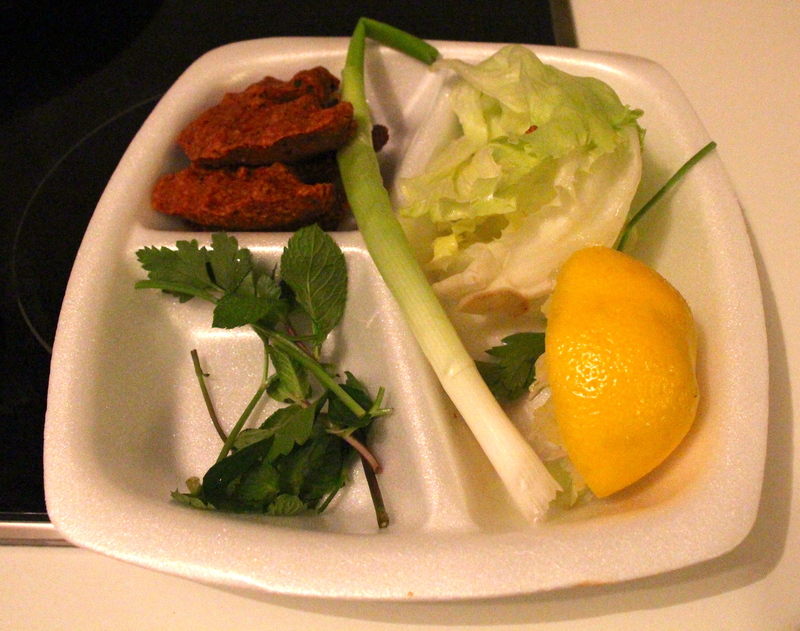 The assembled ingredients. You may notice in the background a few bottles: Edel Weiss (beer) and Winter Jack (Jack Daniels flavored with apples and spices). Served with bread, we were given a bunch of the pieces up in the upper left corner, which were spicy and yummy, lettuce, herbs, lemon, green onion, and a tasty little sauce. Surprisingly good, I say! 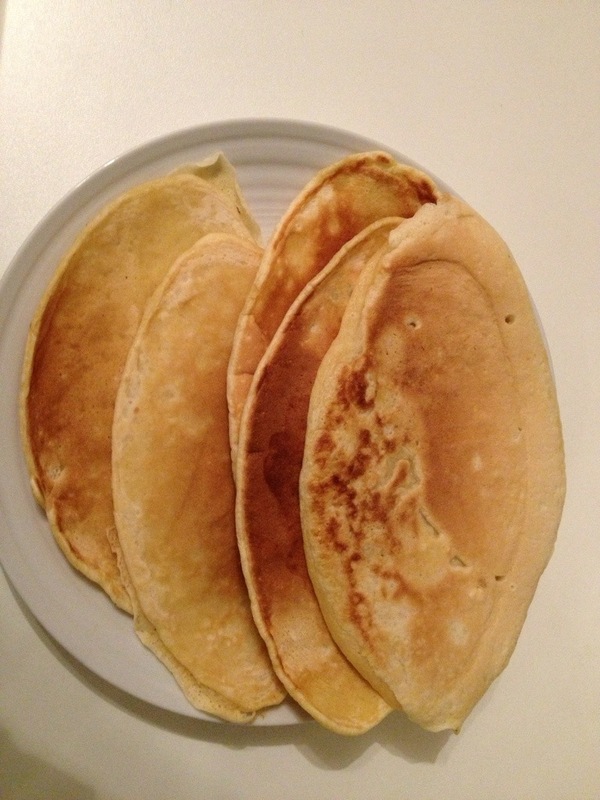 I know what you are thinking… What does leftover food from last night have to do with buttermilk or pancakes? Last night, we went to a Turkish restaurant for dinner. Not just any Turkish restaurant, mind you, a vegan Turkish restaurant that offered to wrap up our leftovers (this is not an incredibly common thing in German, the idea of taking leftovers away from a restaurant; many places, I’m sure, this would be considered poor form, in fact)! VEGAN! RESTAURANT! 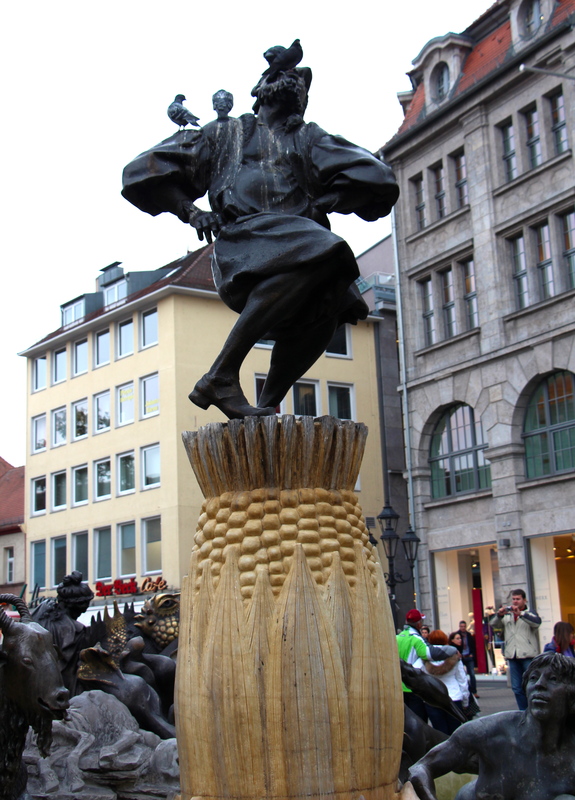 ASCHAFFENBURG! Imagine that… (oh, happy, happy day…) Anyway, our leftovers included 1/2 of a lemon which, when added to a couple of cups of milk work as a good buttermilk substitute (1 tablespoon per cup of milk, in case you were wondering). Providence! 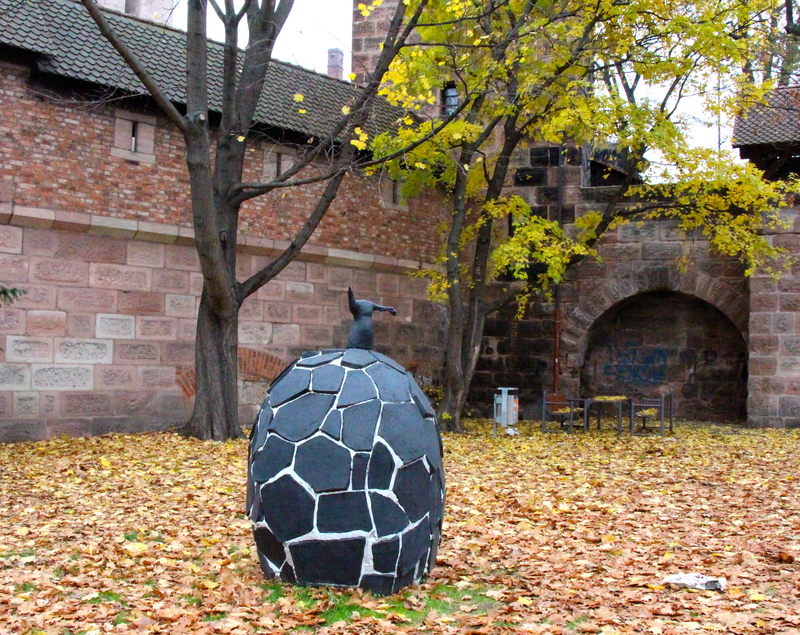 The entrance to the garden at Mathildehöhe (the Darmstadt quarter where the Künstlerkolonie (aka “Artist’s Colony”) is located. 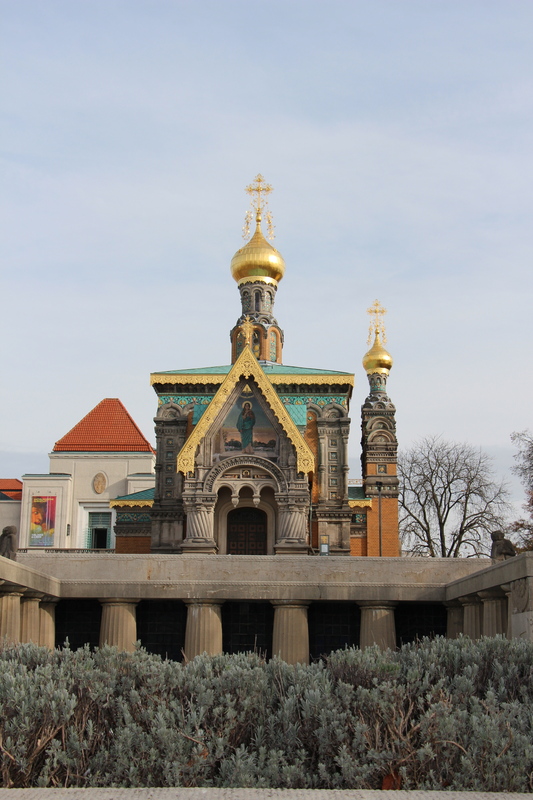 The Russian Church from the reflecting pool. 🙂 We found the timer on the camera! 1. When traveling, roller bags are ALWAYS a good idea. Don’t let anyone tell you differently. Having toted around a duffel bag on one shoulder and a computer/book bag on the other shoulder yesterday (up and down untold numbers of flights of stairs; funny thing: I had actually considered adding the concept of consistently working escalators to my list of “things that I love about Germany.” Then, I threw a couple of heavy bags on my back (metaphorically) and suddenly a remarkable number of escalators were out-of-order. Should I take it personally? Is it a sign of the apocalypse? Your call. ), I am here to tell you that roller bags are ALWAYS a good idea. 2. Hurricanes can really throw a wrench into a perfectly good plan. Even hurricanes that are thousands of miles away. (I add this not to be insensitive to the genuine danger and havoc caused by this deadly storm, but because it is a part of my story.) I had made an appointment to be at a particular place at a particular time to take a particular test which I am going to be unable to make due to the hurricane and related travel difficulties. Very sad. Tragic, even (though definitely not as tragic as what some people in the path of the storm have experienced). Upon calling this particular place to cancel my particular time, I was told that I may be given a refund as the “Big Brother” may understand the extenuating circumstances given the weather, and that this particular call center employee did not want to cancel my appointment until Big Brother had a chance to weigh in on the matter. Upon calling the “Big Brother,” however, I was told that they are not working due to the danger and difficulties caused by a certain storm (why call center lady didn’t know that part of the story is still beyond me). And, in the meanwhile, I am unable to reschedule said appointment because I can’t cancel the 1st appointment, so now, I’m pretty much stuck for the time being. And stressed. And sore (see point #1). And I really want to go ahead and be done with it, darn it! Please say a prayer that this works out somehow. 3. 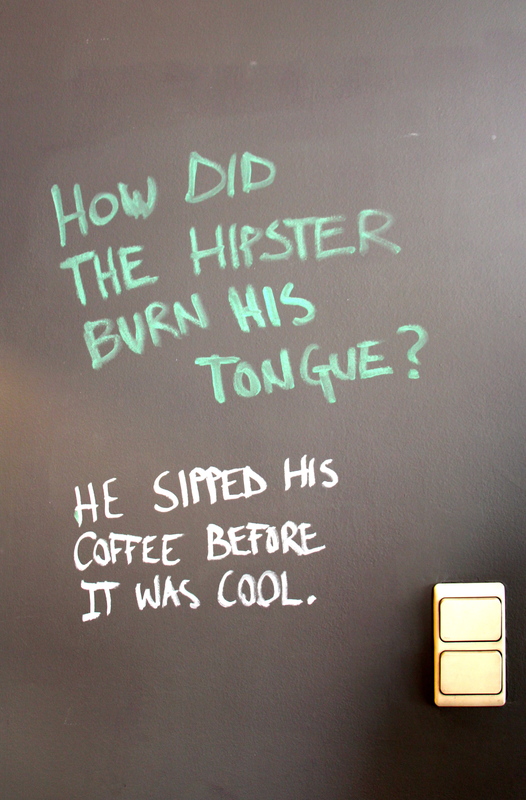 Everything does, in fact, get better with Starbucks. On my little adventure yesterday, I took the train by myself! 🙂 I figured out where I needed to go, purchased my tickets, and made multiple transfers. While this may not seem like that big of a deal, let me assure you that it is a VERY BIG DEAL. I am selectively independent, and logistics are one of the areas I choose to de-select. I look at a map and usually get more lost than I was to begin with, so this is a very adaptive choice most of the time. However, I did manage to take 3 different trains involving 4 different stations (while carrying said bags up and down said stairs while wearing clothes that were much more appropriate for my originally planned activity of sitting in an artificially heated environment) BY MYSELF. Combined with the previous day’s success driving a stick shift car IN THE SNOW (which I adamantly avoid ever since the “Blizzard of 93” (trust me, if it is a blizzard in Atlanta, it is serious business; also, as an aside, when I typed this, I was recommended a tag of “1993 Storm of the Century;” I hope that puts this in perspective for you. ) 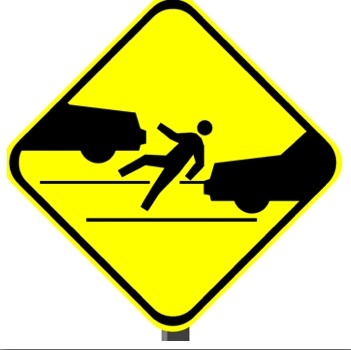 incident involving ditches and semi-trucks), I am feeling very empowered with regards to my own transportation. But anyway… back to Starbucks… While I ended up successful with the train situation, it did not come easily, and there were many extra stairs to run up (while toting the bags) than would have been absolutely necessary. After one such unnecessary trip down and back up (8 flights of) stairs in an un-heated building, I felt like I may be entering into an alternate reality when suddenly, just out of the left corner of my eye, I saw the familiar font and the familiar green reading “Sta…. Cof…” (the angle coming up the stairs was such that I really couldn’t see the ends of the words). Rejoicing filled my heart, and a new spring appeared in my step as I fought through the desert of train-station-land and arrived and arrived to the site which summoned me. Starbucks! Hallelujah. And, as if to say, “we got you, girl,” they are celebrating their 10 year anniversary in Germany this week, so I got a nice little discount on my warm and tasty beverage. ****ahhhhhh**** I felt renewed and remarkably, for the next half an hour, I travelled up nor down any unnecessary stairs. PTL. 4. Expectations are bad news bears. They will bite you in the rear end. Don’t have them. I’ve learned this lesson before (and I expect to learn it again), but as always, dear reader, I am thinking of you and want to pass on what I am learning. Expectations are like assumptions and are best avoided. Today, I will leave you with some of the images of the graffiti and street art we’ve seen. It hasn’t been Banksy or even Banksy-esque, but… I’ve laughed, I’ve cried, I’ve averted my eyes (none of these examples are included; again, you can thank me if you would like), and I’ve appreciated. I hope you do, too! 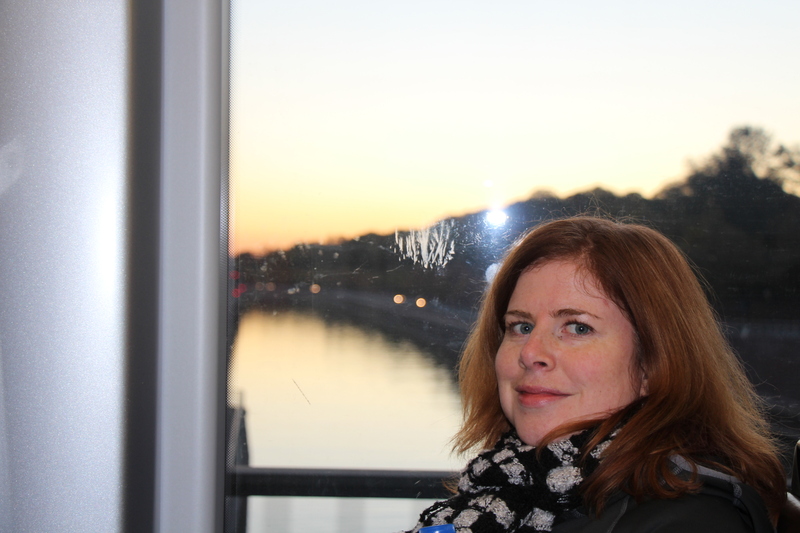 As scene from the tram on the way back from the Atomium (in Brussels). 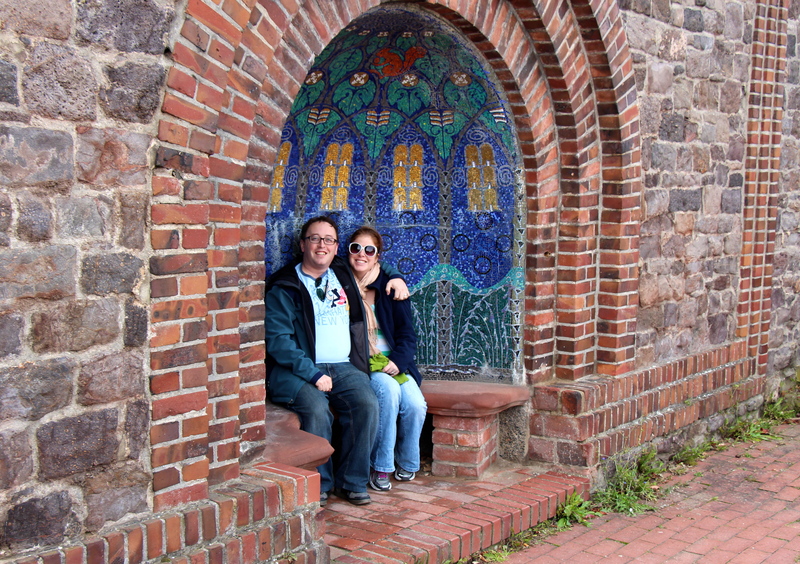 Mike and I arrived in Germany 7 weeks ago today. Time has begun to shape shift for me, I can tell you that for sure! This morning alone, I have already (successfully to this point) juggled 5 loads (loads are relatively small here) of laundry (I’m a big believer in clean sheets. All the time. 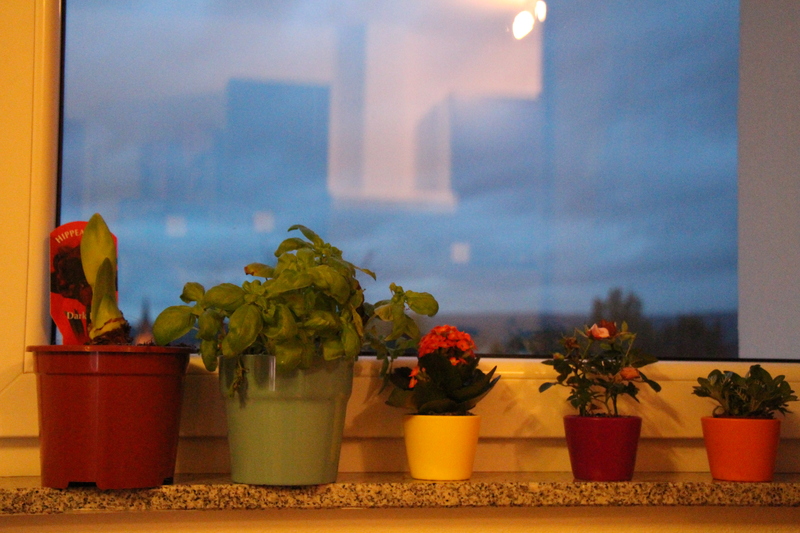 It makes my days happier and my weeks more cheerful. Trust me: Clean sheets is worth a potential 5 Euro investment, but as if the universe wants me to have clean sheets, I’m getting 2 loads WASHED + DRIED for free! That kind of thing makes the 4 flights of stairs a lot shorter…), sorted all of our different trash containers and recycled/disposed appropriately, cleaned up (which I can’t accurately portray here, but trust me: IT IS DIFFERENT! ), etc. None of these things are remarkable in and of themselves, but they are all at least a little bit different than how I would do things in my “normal” life, and they have somehow happened as if nothing was really different. I guess that means I am adjusting. Yay me. 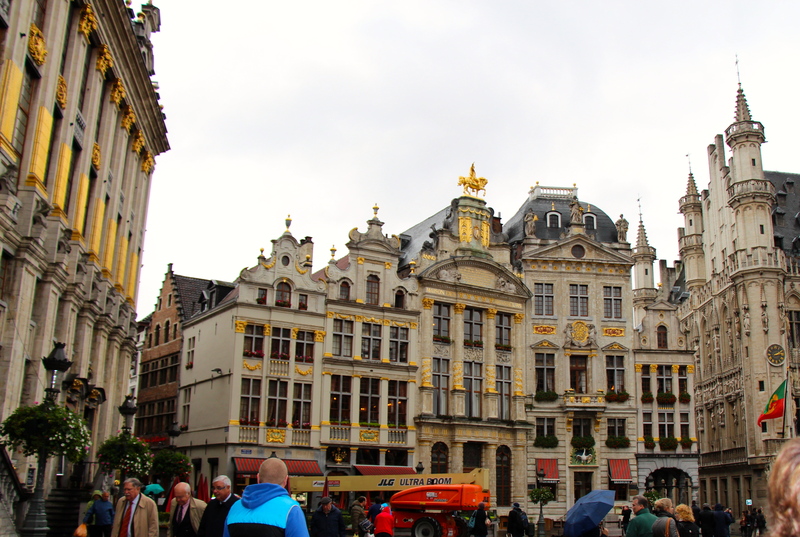 So, yes, we spent the weekend in Belgium (and escaped the even worse weather where we live!). 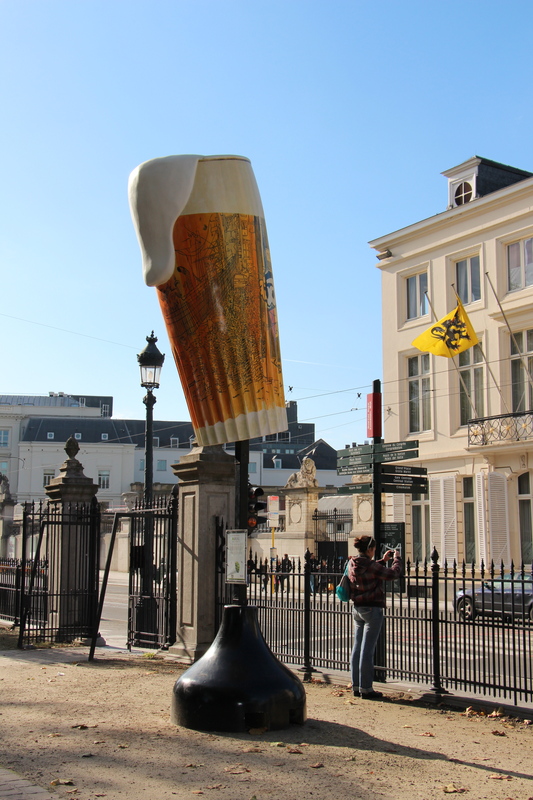 And we went to a beer museum. And a lot of other things. 🙂 This adventure is to be continued, but I wanted to share a slice of our weekend! 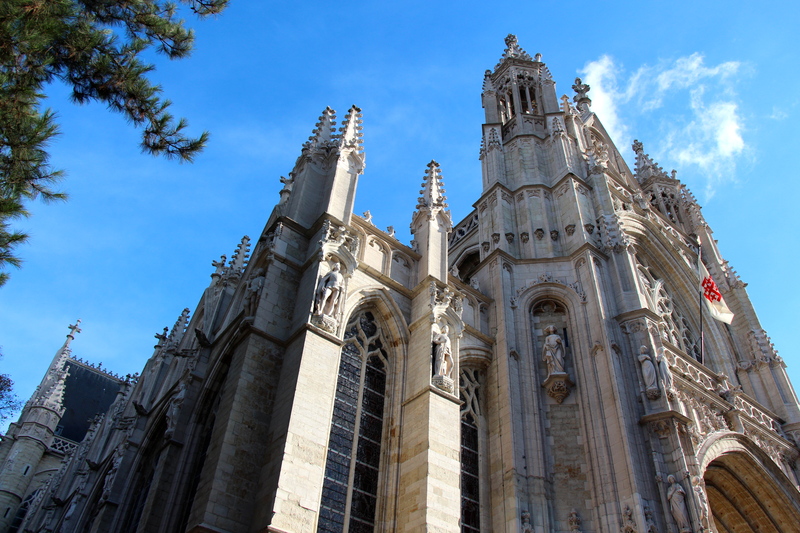 Also, I wanted to brag as quickly as possible (expect this to shift to as often as possible in the near future; the bragging, I mean): I drove our (manual-shifting) car through 3 countries and on and off the highway!!! Yes, Moi!! And in a small town (but that didn’t go as well, so we aren’t going to dwell on it).. 3 COUNTRIES! 1 day! 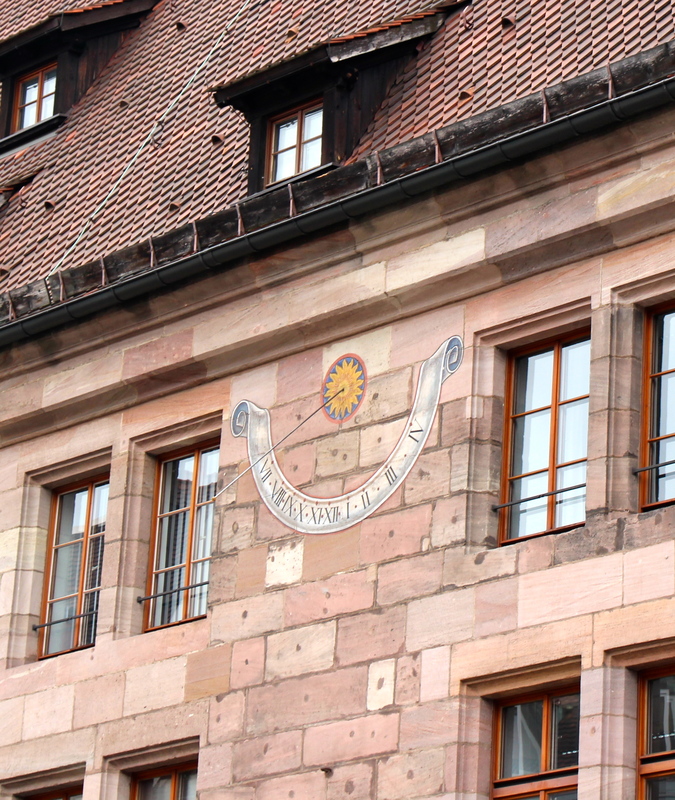 Hotel de Ville, capped by the Archangel St. Michael. 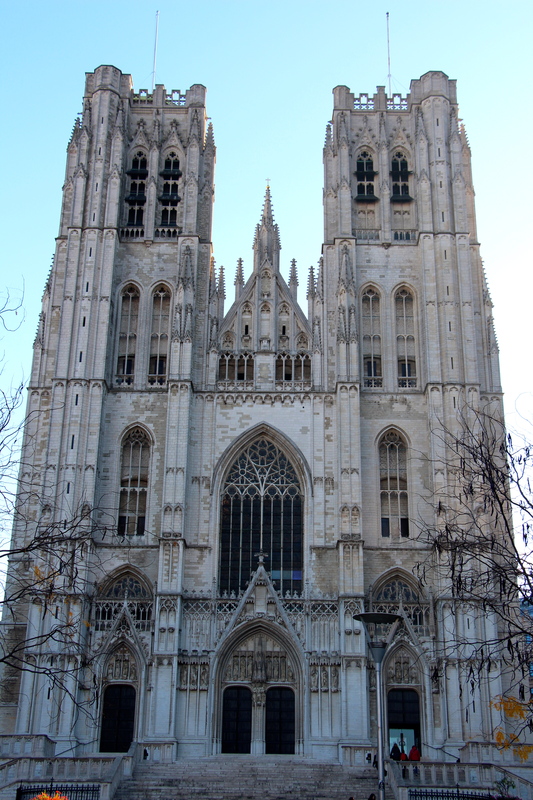 Gorgeous in all its Gothic beauty, it has graced the Grand Place since the early 1400s. 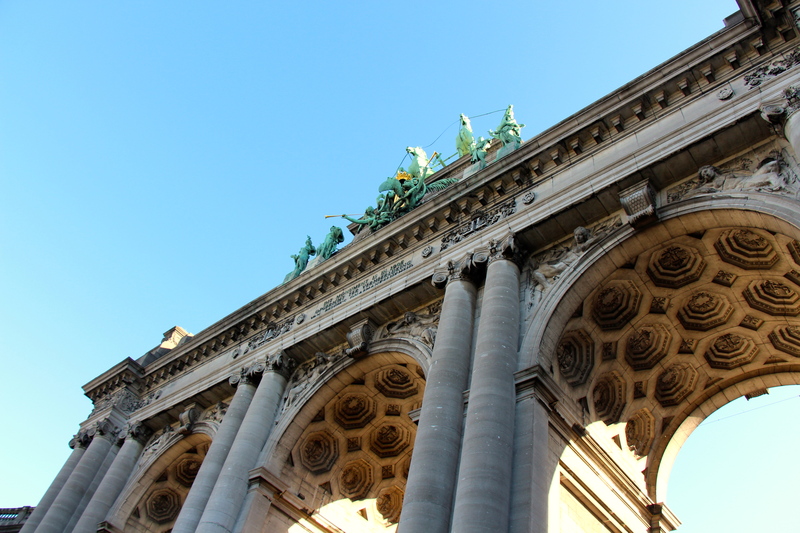 Our first look at the Grand Place, a magnificent square in Brussels recognized as a Unesco World Heritage site. 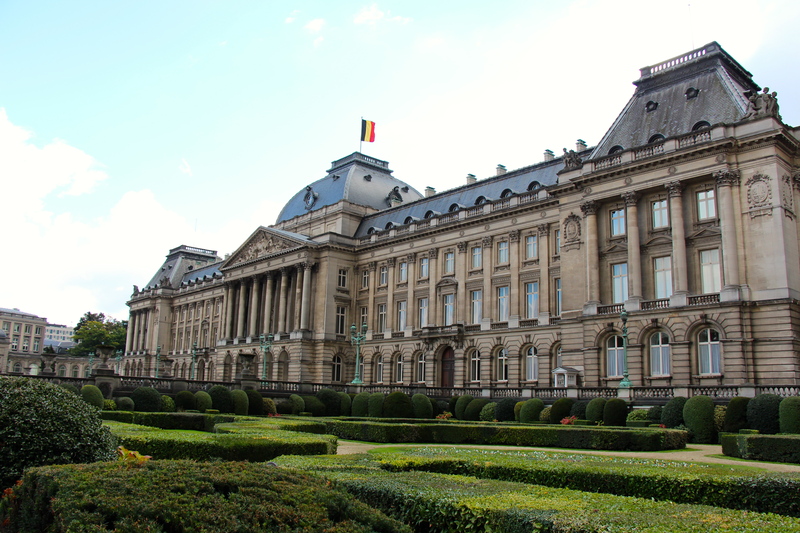 In addition to the Hotel de Ville, there are a number of buildings surrounding the square, including the Maison du Roi (King’s House), which now houses a museum. 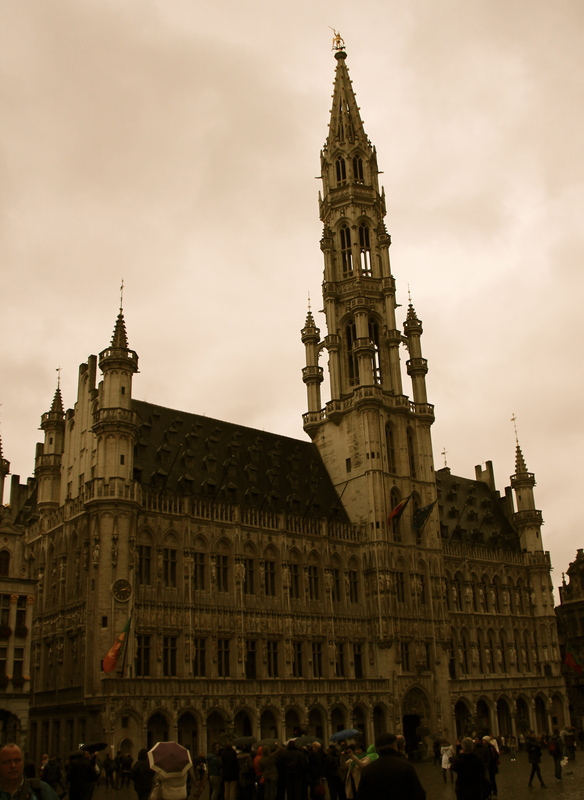 Really breathtaking, in spite of the terrible weather which greeted us when we arrived in Bruxelles. 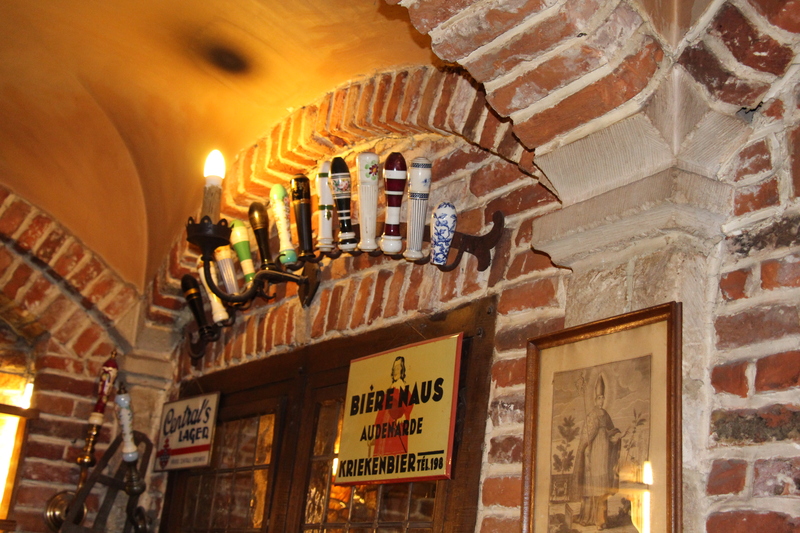 Inside La Maison des Brasseurs (the house of the brewers) on the Grand Place. 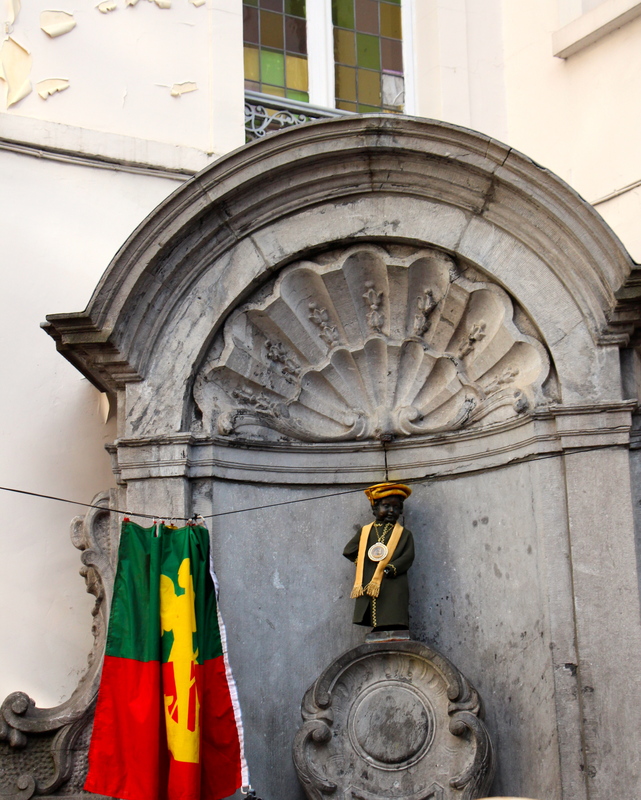 When we arrived for the Mannekin Pis, we were there for the unveiling of one of his outfits! It was quite a spectacle! Stay tuned for the rest of this story! 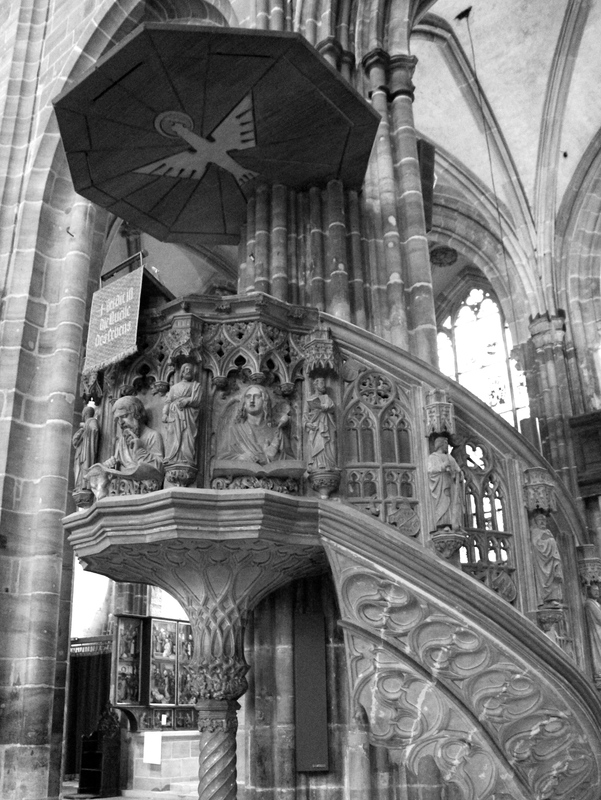 The Sablon Church, a branch of Notre Dame de la Chappelle. The original palace, from the way way back machine, was wrecked in a fire in the early 1700s. It was later buried to make the ground flatter (did I mention that we saw more runners in Brussels than anywhere else added together?) and a new palace was built. In the early 1900s, there was some more construction which revealed the remains of the original palace, which has since been preserved through archeological processes. 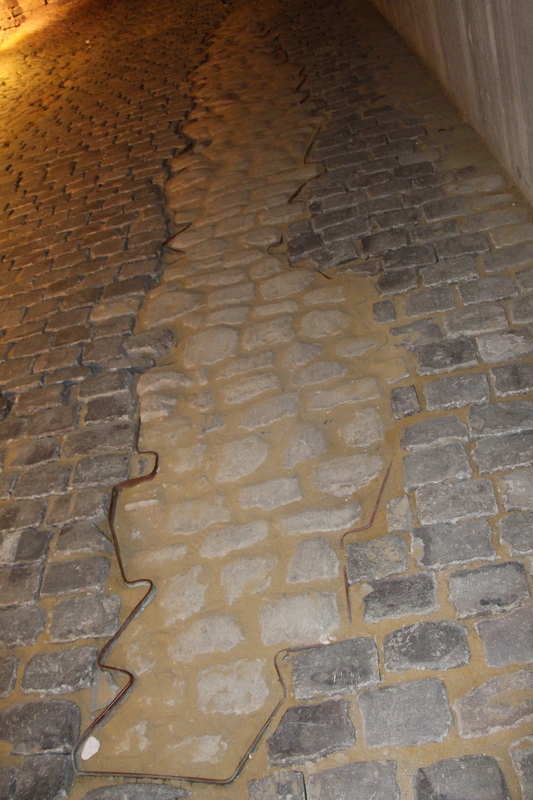 This image is of the Rue Isabelle, and the white cobblestones are some of the original ones from the 12th century. 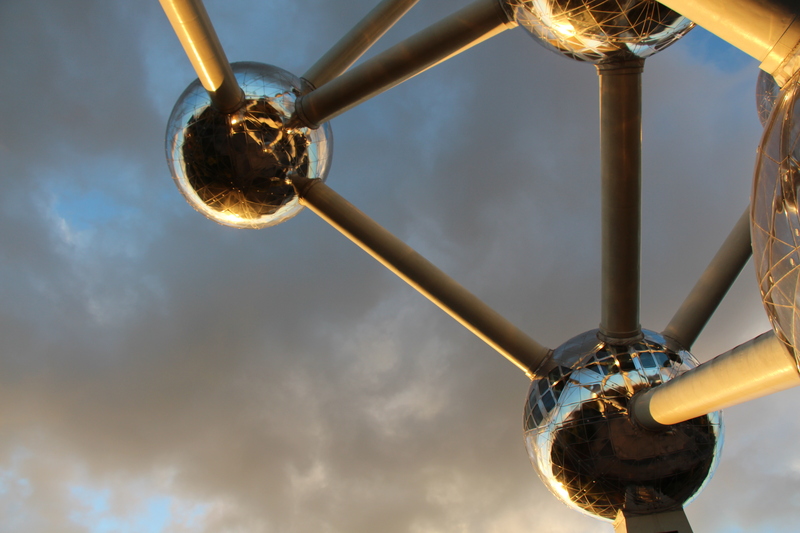 The Atomium, built for the 1958 World’s Fair. Mike was playing with the camera on the subway/tram. Does this look spell tired and hungry? Yes, whether you speak English, German, Flemish, or French, this says poor pitiful soul. Hello! Happy Thursday! Thursdays are my favorite days. The promise of a weekend is so close I can taste it! That’s all I’ve got for today. Not that there aren’t 1,000s of other things that are a wee bit different, but we’ll save those for another day. Tchüss!